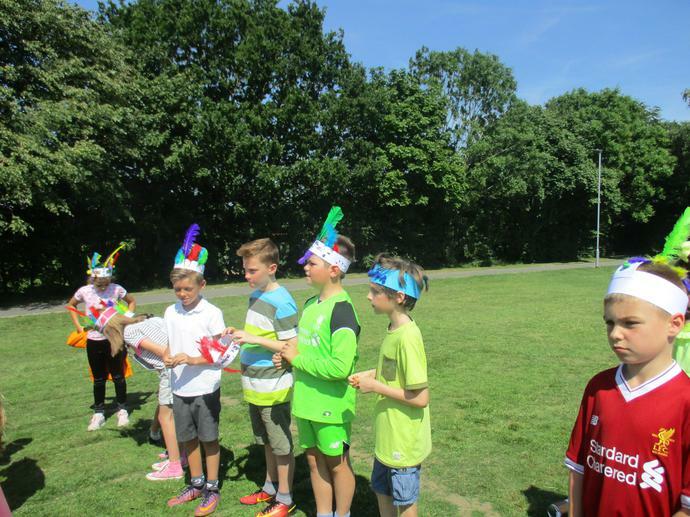 Year 4 and 5 joined up to hold a St Lucian carnival this week. 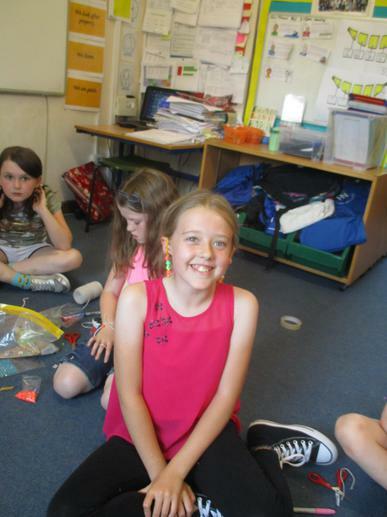 It was a lovely chance to end our topic on St Lucia and to get creative. 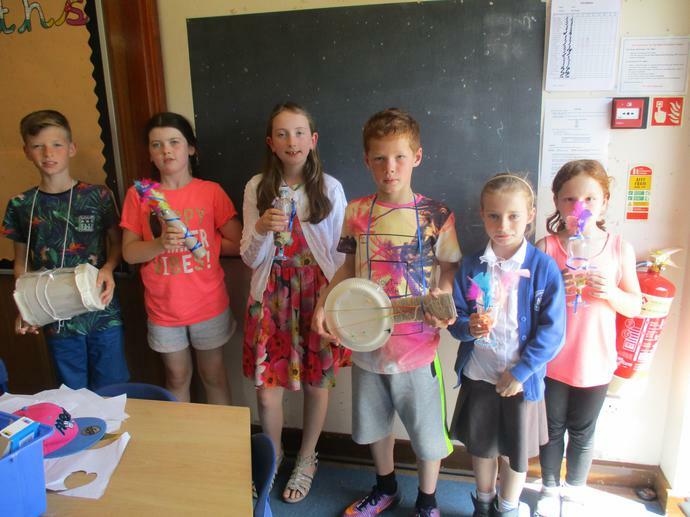 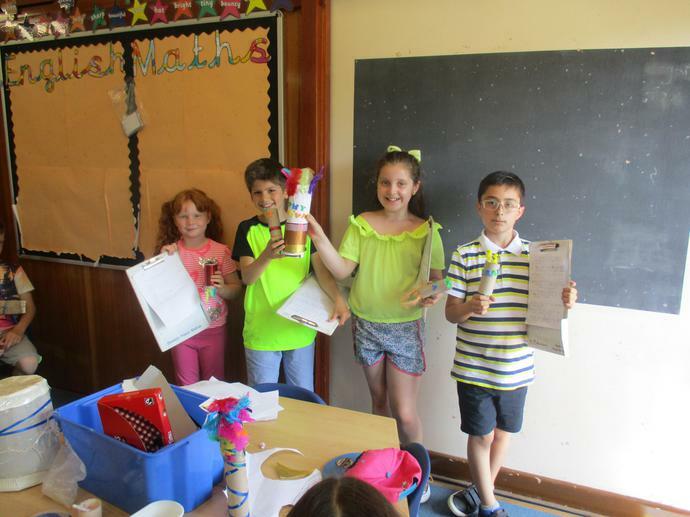 The children studied past St Lucian carnivals and designed and made different items for the carnival in groups. 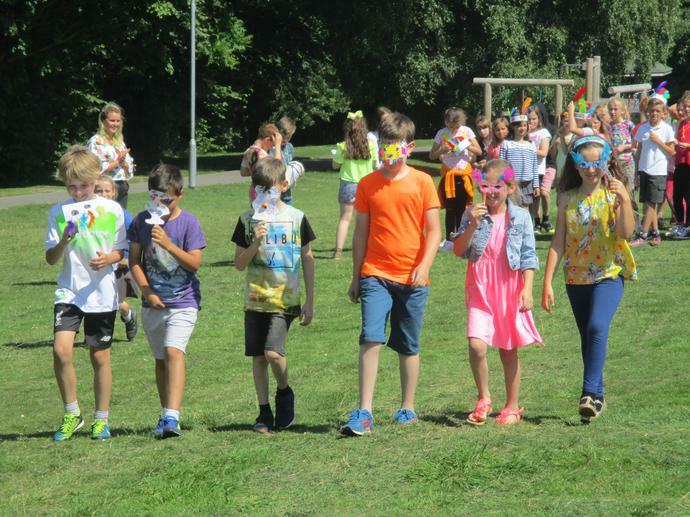 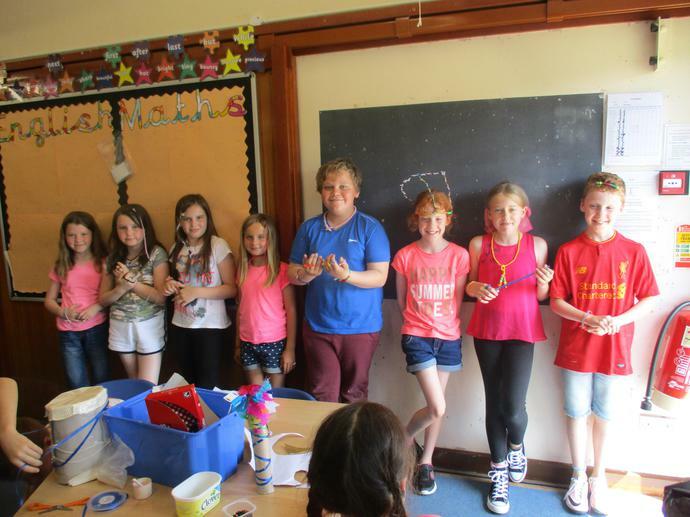 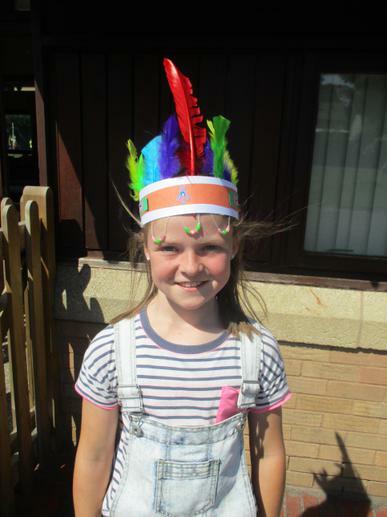 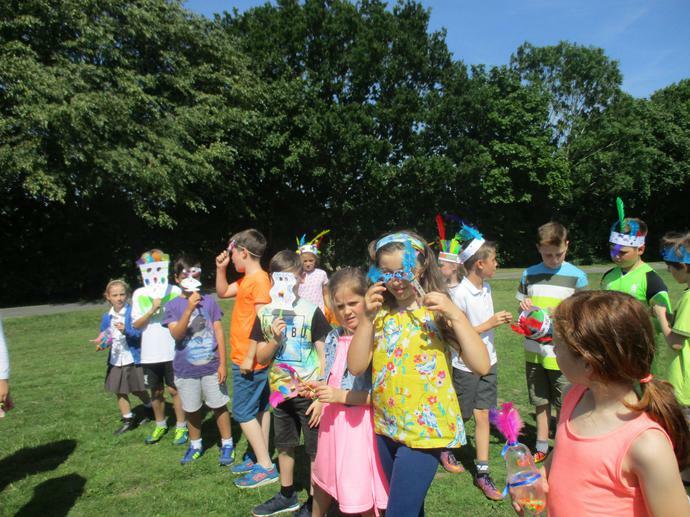 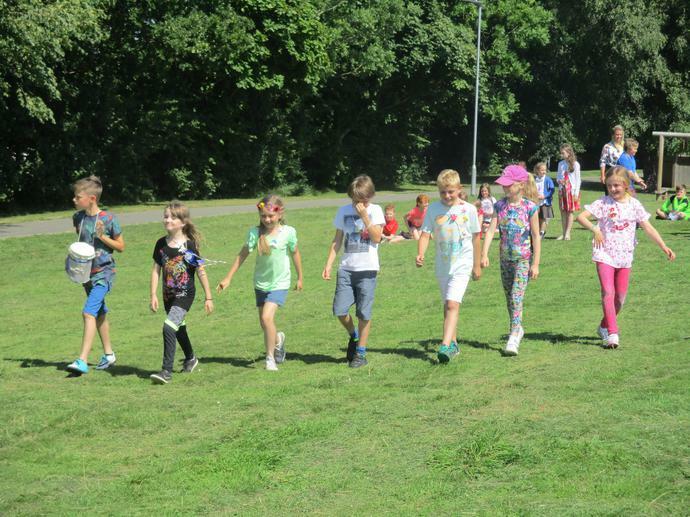 The children thoroughly enjoyed using their imaginations and working collaboratively to produce some very colourful creations, which they paraded on the field during the afternoon! 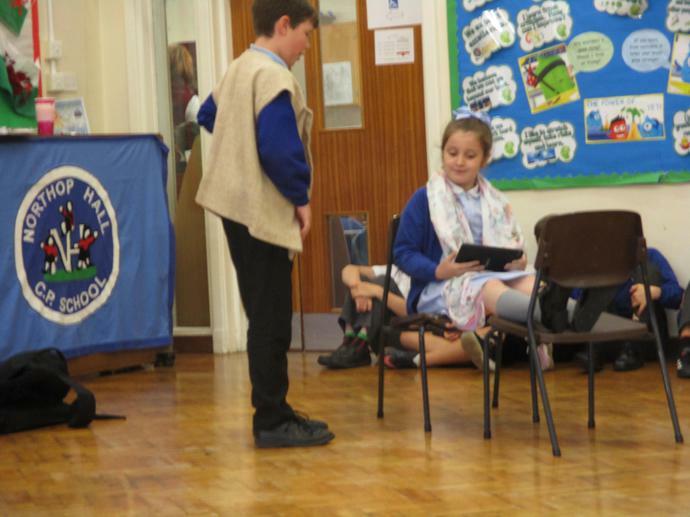 A huge thank you to everyone who came to watch Year 5 perform their version of the children's novel 'Skyhawk' by Gill Lewis. 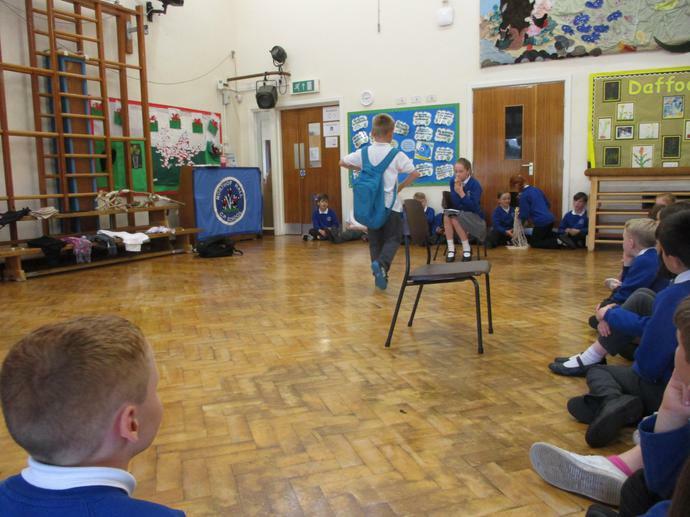 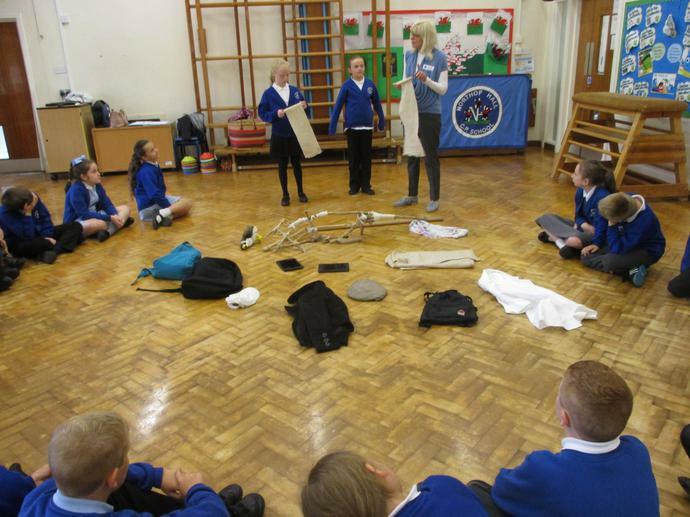 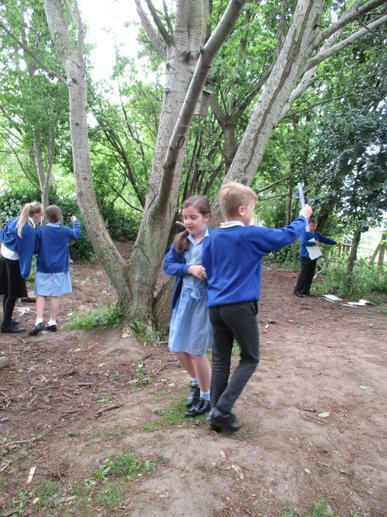 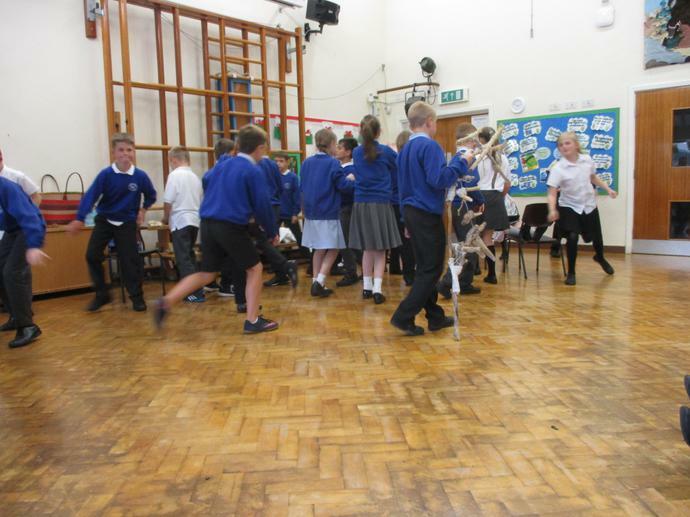 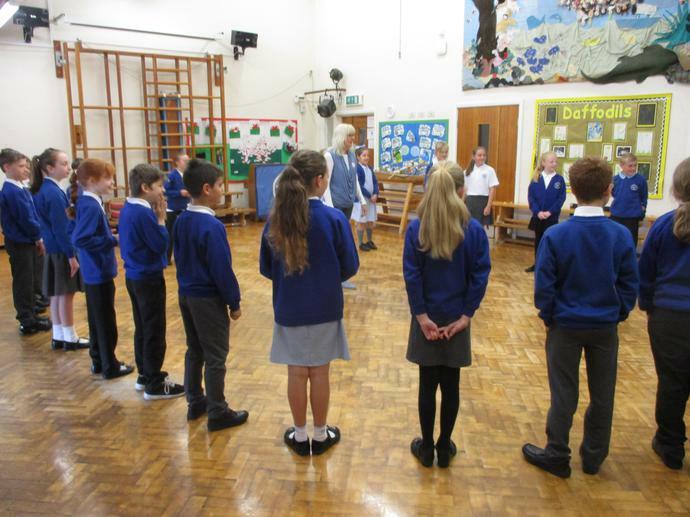 Year 5 studied Skyhawk during Autumn term, so it was lovely for them to have the opportunity to re-discover the story through drama. 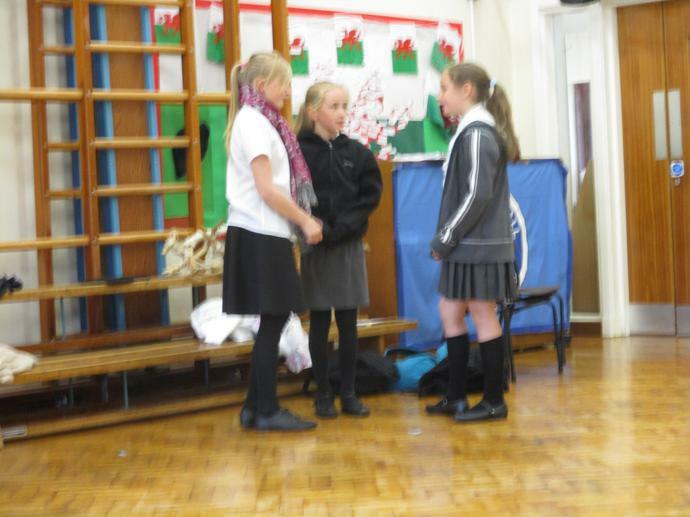 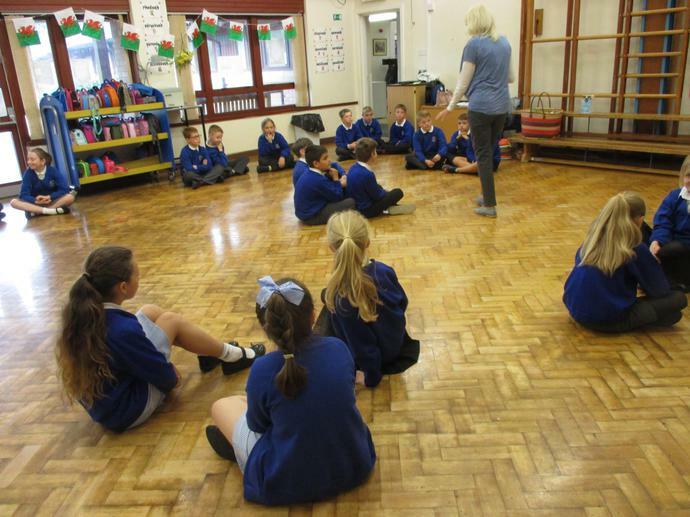 Year 5 worked extremely hard all day with Jane Meakin to put together their scenes, with very little rehearsal time. 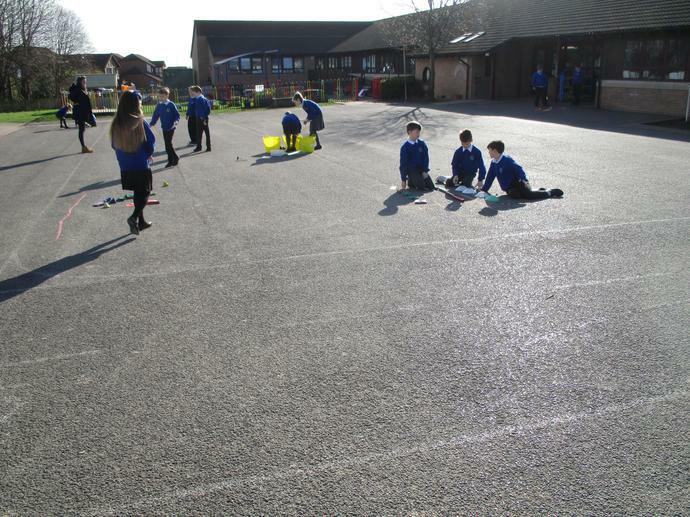 Everybody thoroughly enjoyed working as a team to create the scenes and use 'signifiers' to sign post their characters. 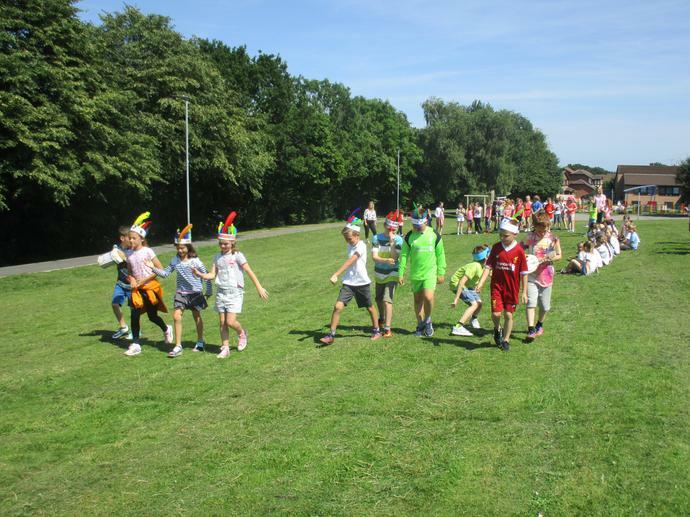 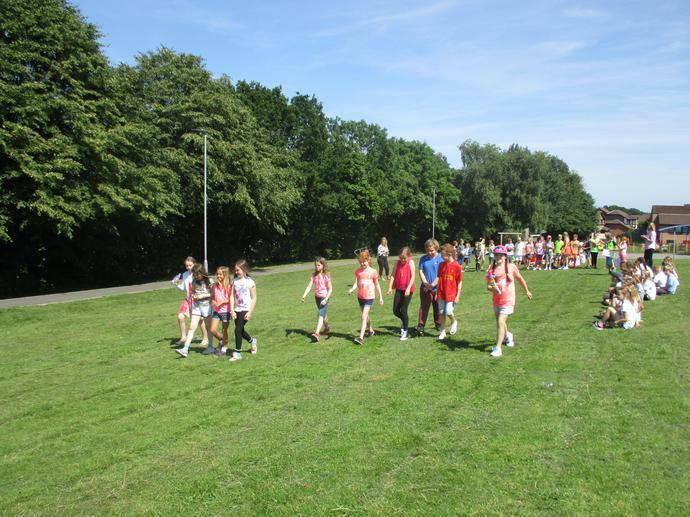 Well done Year 5 for a fantastic day! 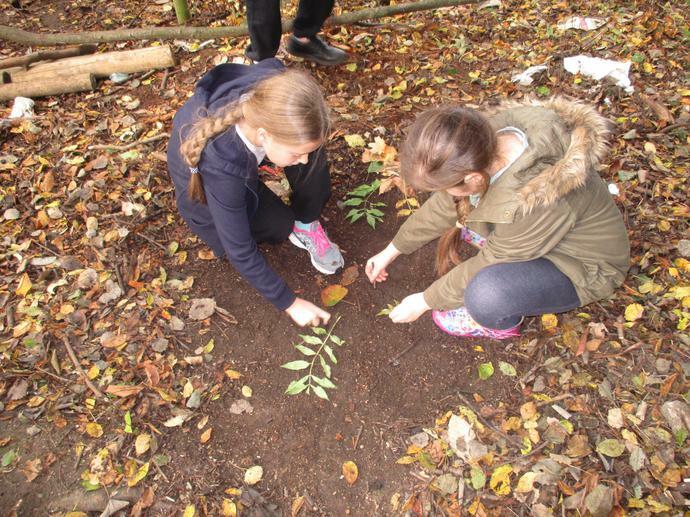 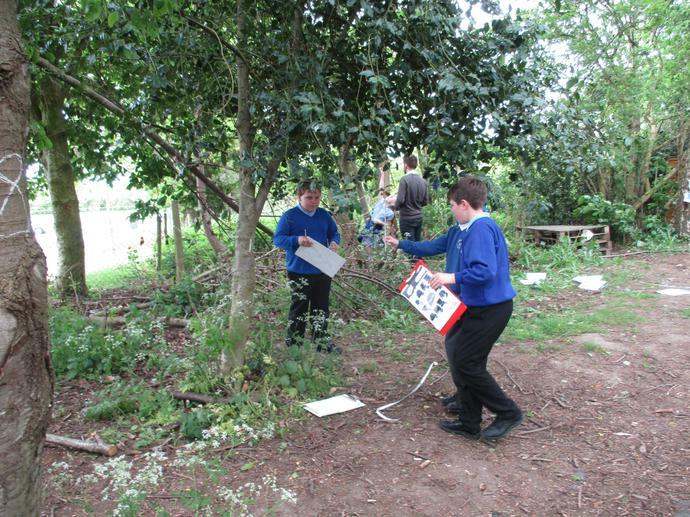 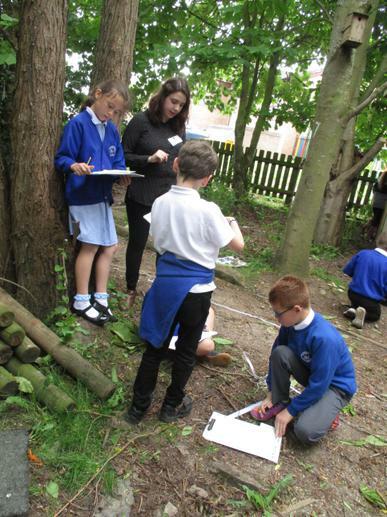 Following the success of our January Science day we decided to hold another, this time in Year 5 we ensured that our Science had an outdoor learning focus, therefore we participated in BBC's 'Terrific Scientific' investigation based on trees and carbon. 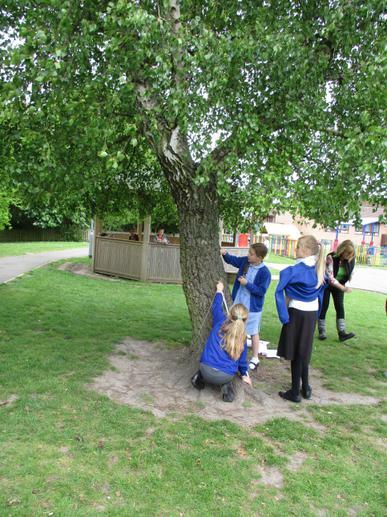 We began the day by finding out what we already know about trees and what we would like to understand. 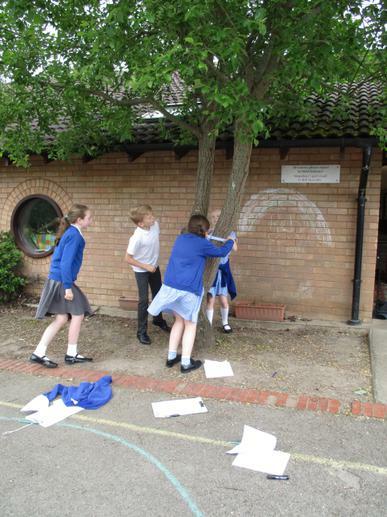 We then learnt that trees take in carbon. 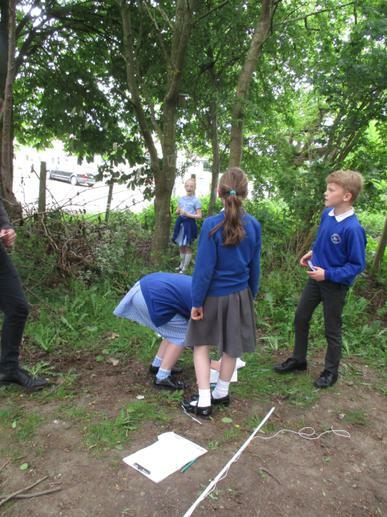 The afternoon saw us venturing out into our forest school and school grounds to measure tree circumference and estimate height in order to use the 'carbon calculator' informing us of how much carbon is taken in by the trees on our school site. 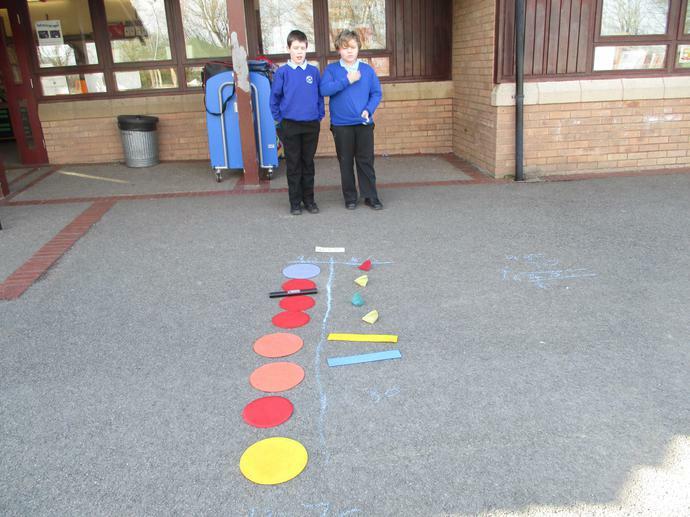 Our results will be forwarded on to BBC Terrific Scientific and used as part of a national study. 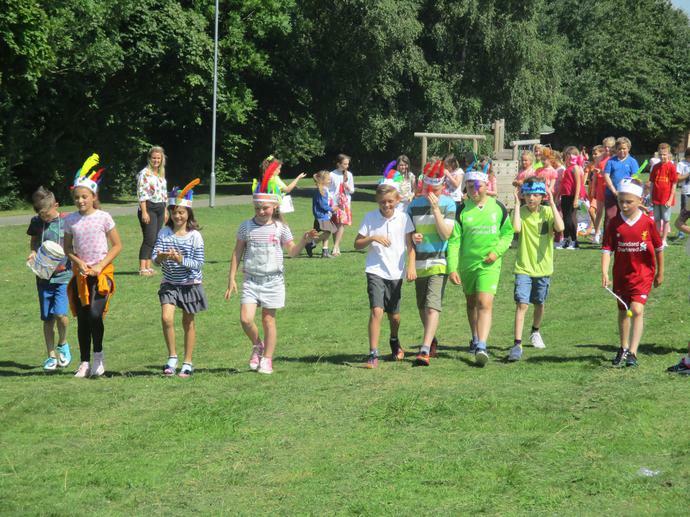 Good work team! 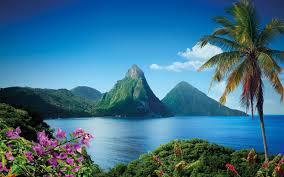 This term Key Stage 2 are studying the Caribbean island of St Lucia. 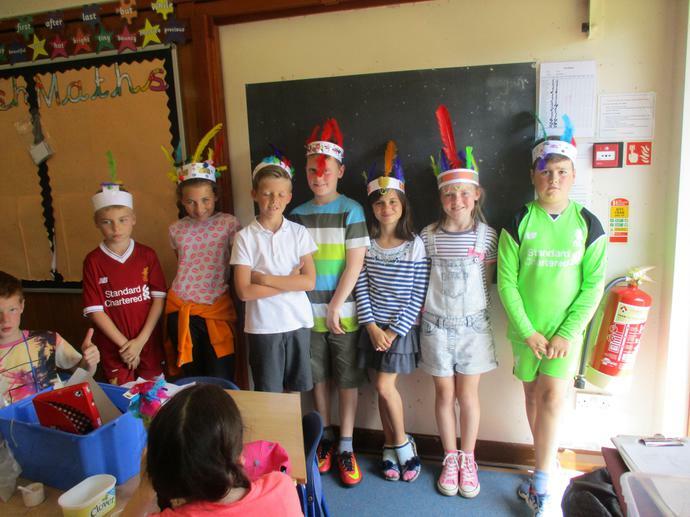 We will be linking this to all areas of the curriculum in order to develop a stronger understanding of this magical island. 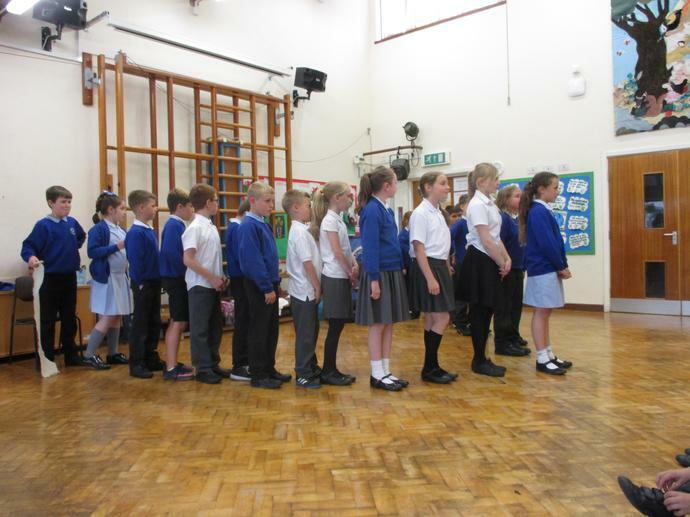 Thank you to Year 5 for your research learning log on St Lucia, this information will be really useful as we navigate through the topic. 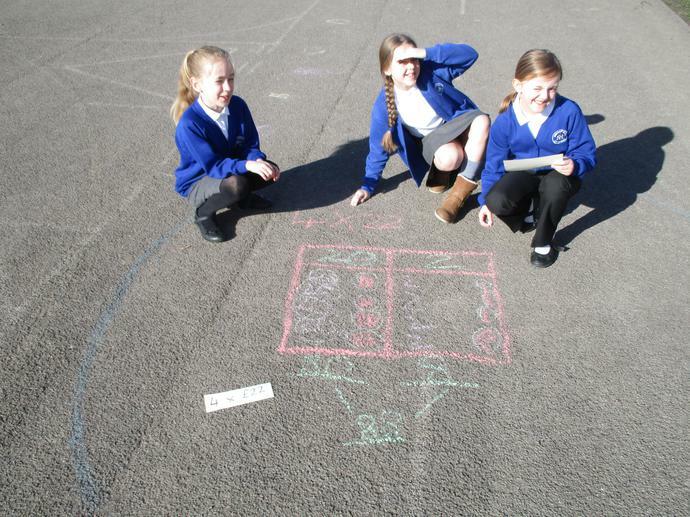 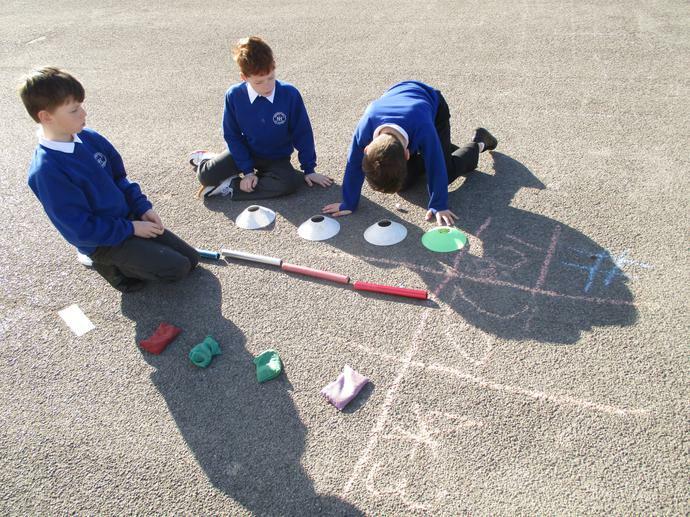 Finally we have had some sunshine, so in year 5 we decided to make the most of it with some outdoor maths. 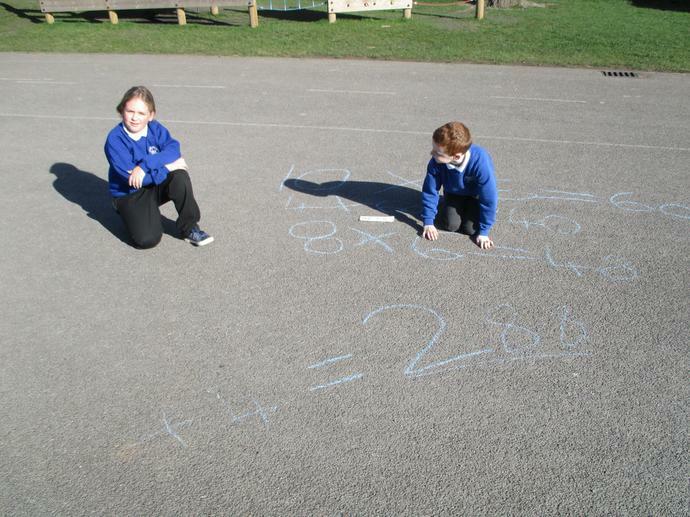 As we have been looking at linking visual methods to written calculations in multiplication, we decided to go BIG and try out our new methods using a variety of equipment and chalks on the playground. 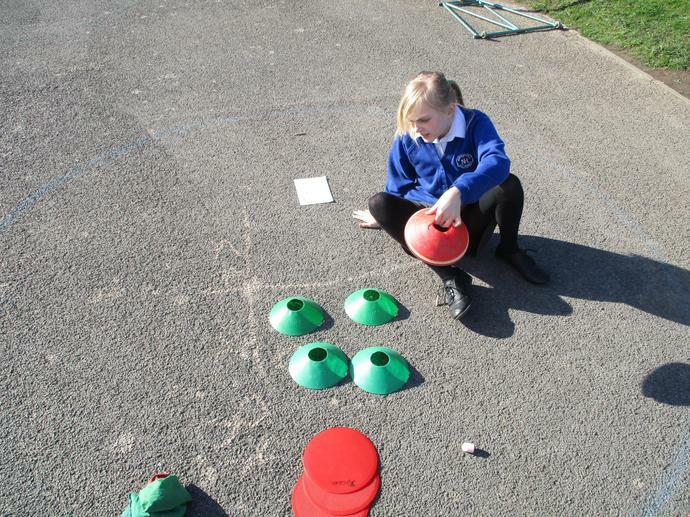 Ask your children to show you some of our multiplication methods at home! 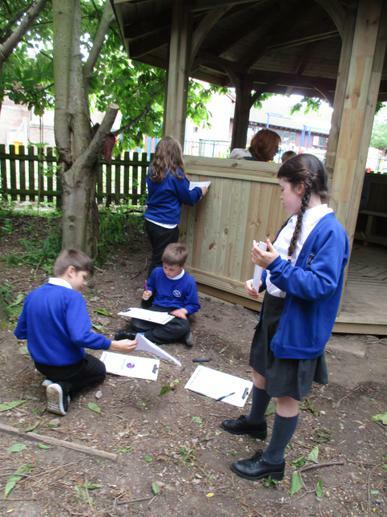 This half term Year 5 are looking at explanation texts and learning how to produce high quality explanation writing. 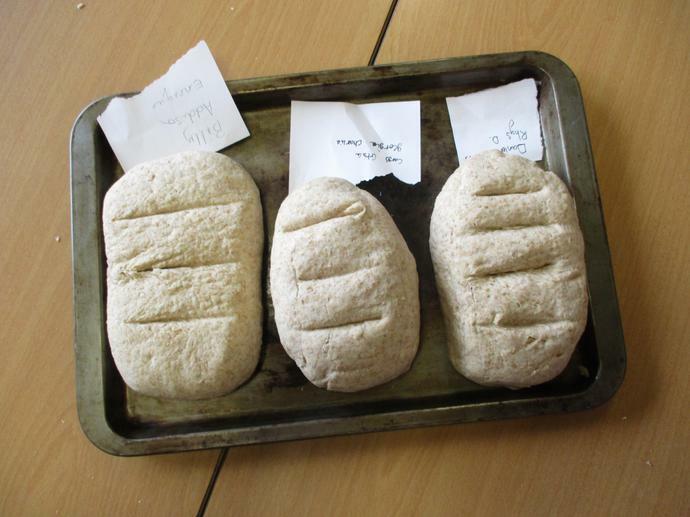 This week we have been building up to writing an explanation piece on making Roman bread. 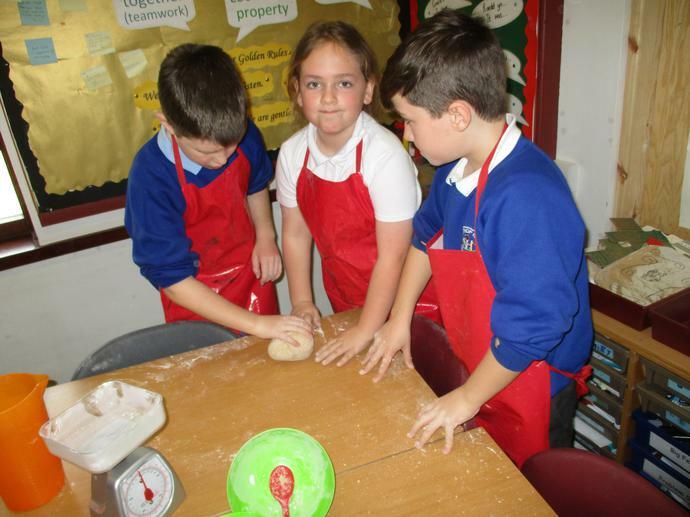 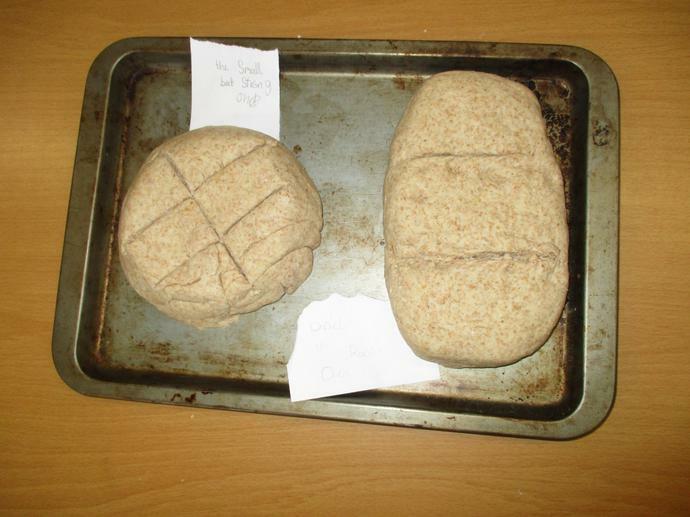 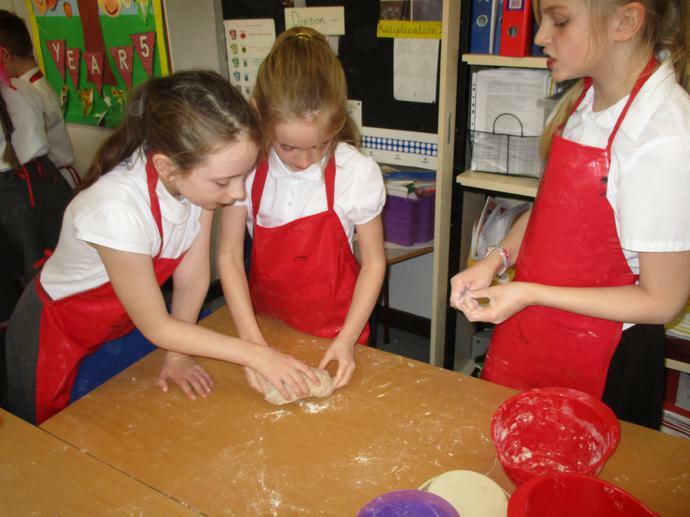 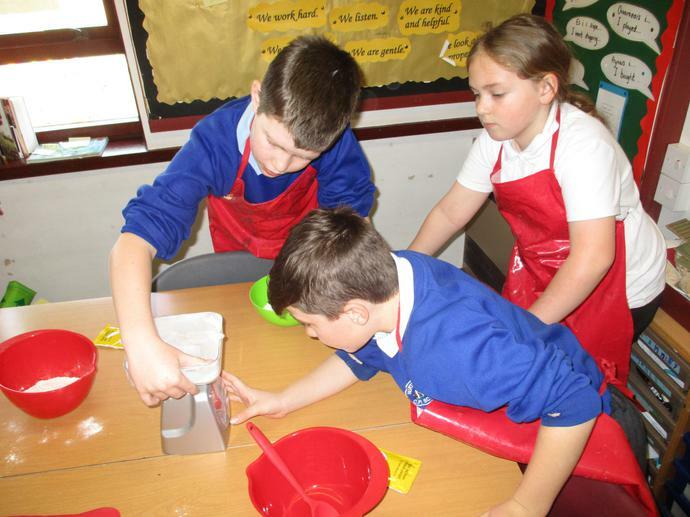 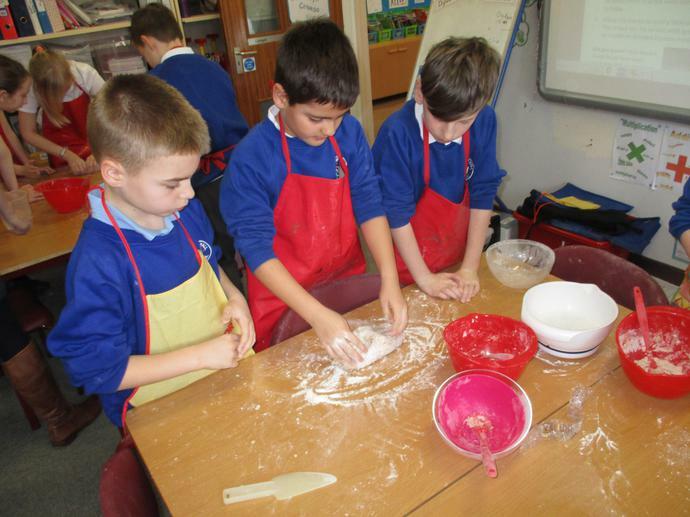 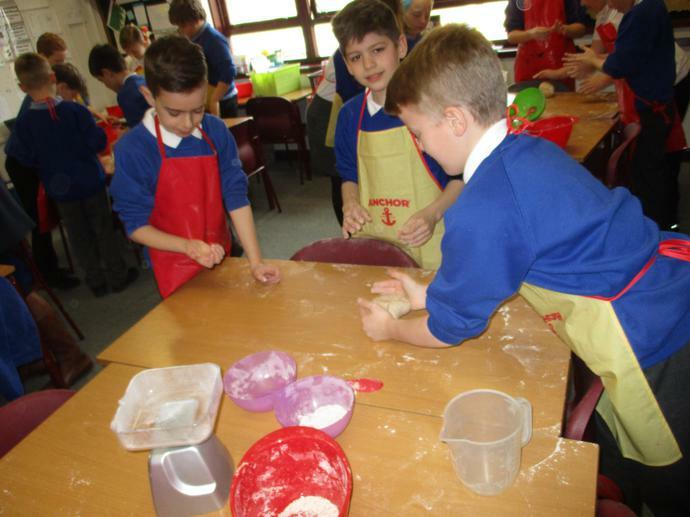 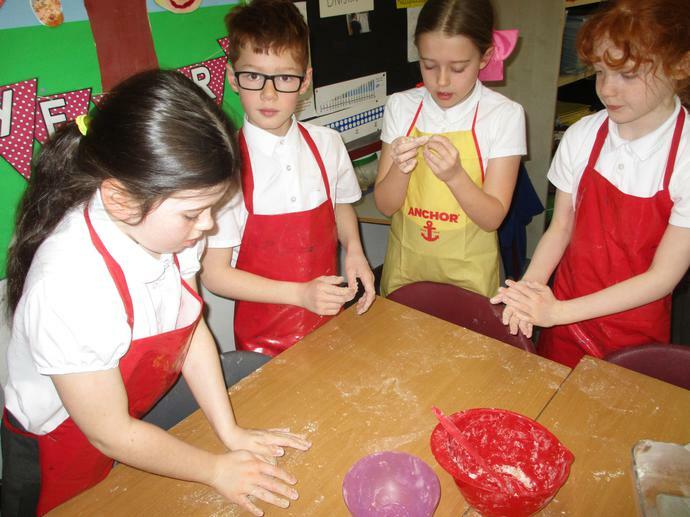 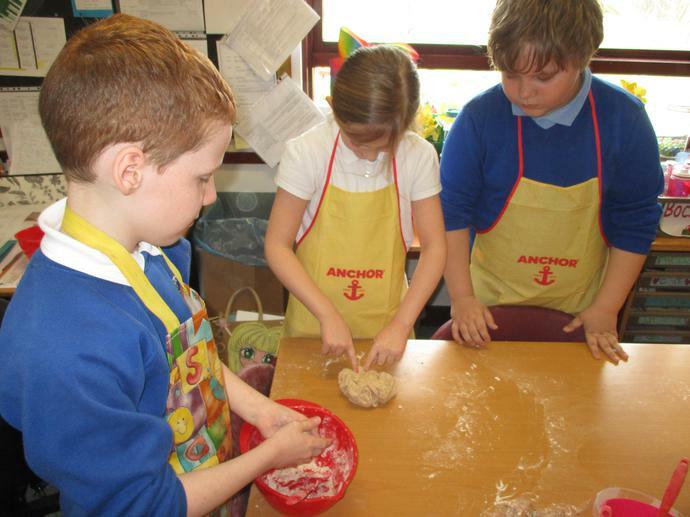 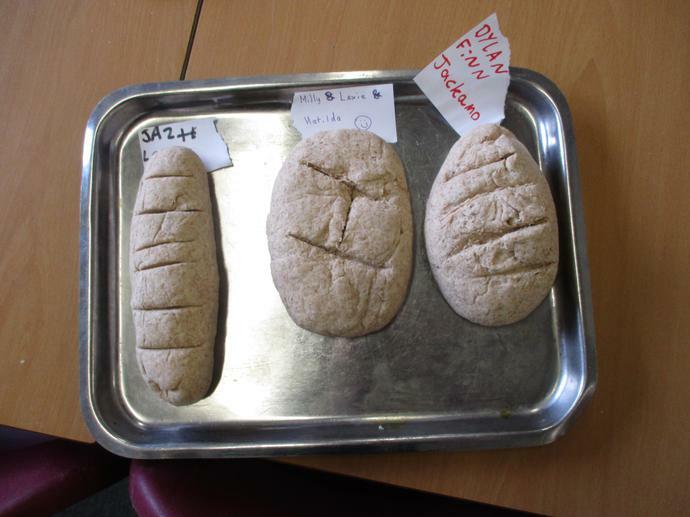 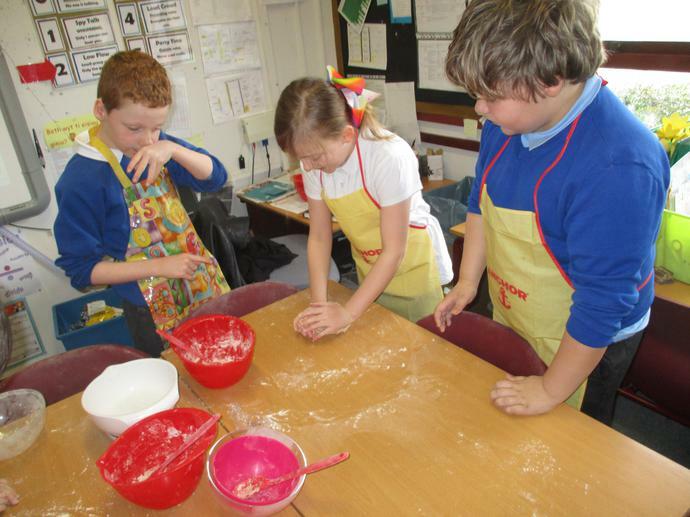 The children have demonstrated a range of cross curricular skills from costing and weighing ingredients to make the bread, using ipads to research the history behind Roman bread and design technology skills to make the bread. 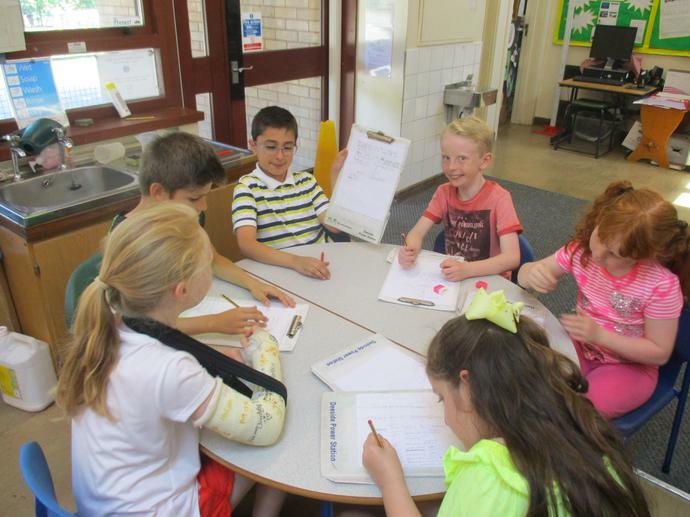 In Literacy we have been building on the features of explanation texts from including conjunctions in sentences to varied sentence openers, ready to write our final text. 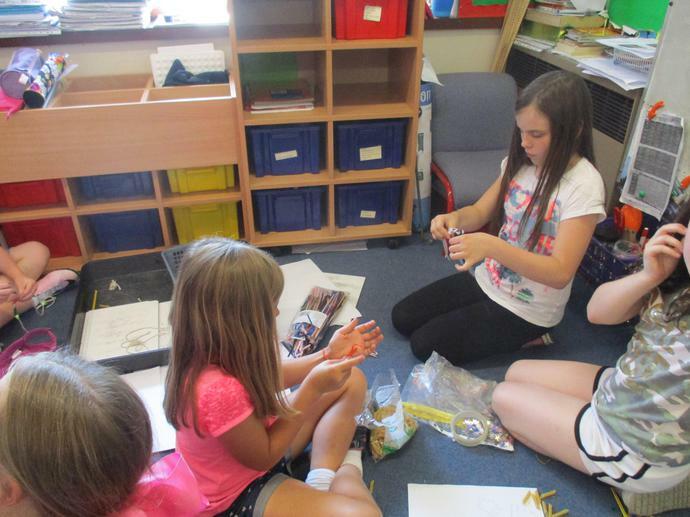 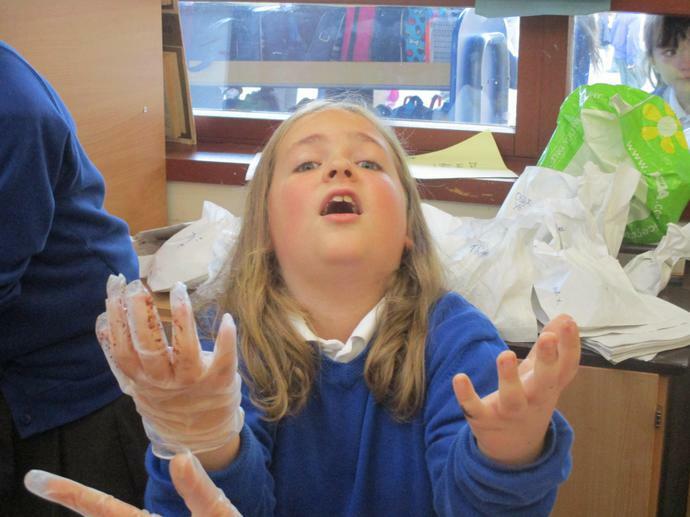 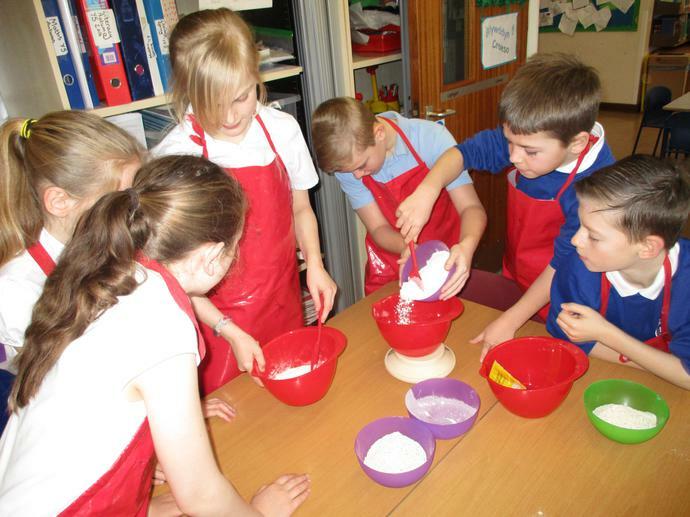 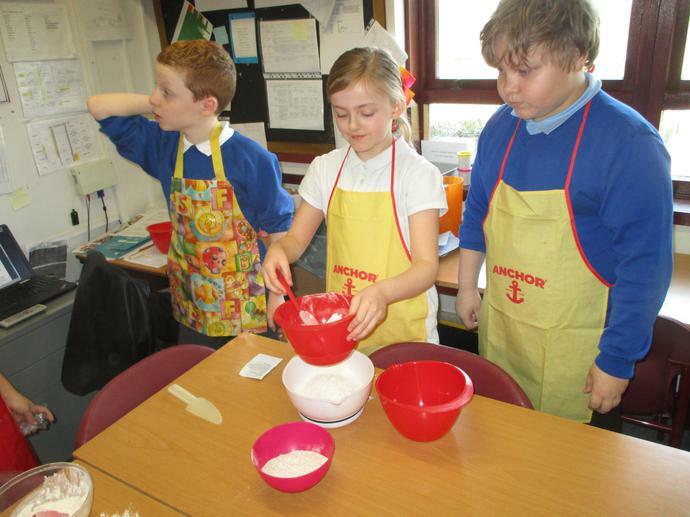 The buzz around Science day this year has been really exciting, particularly in Year 5. 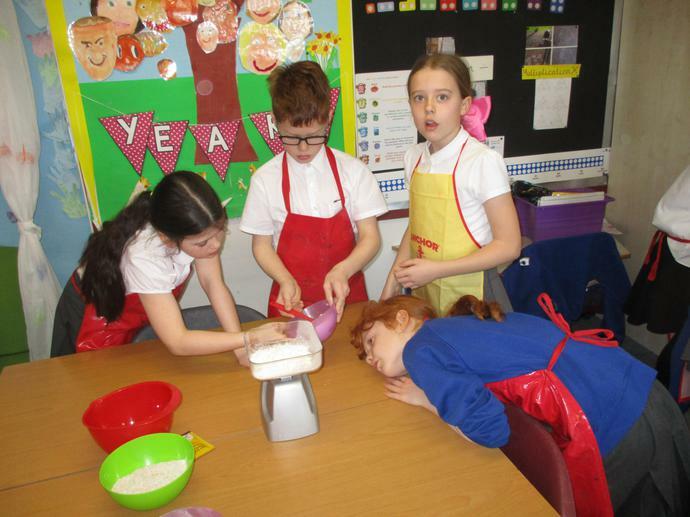 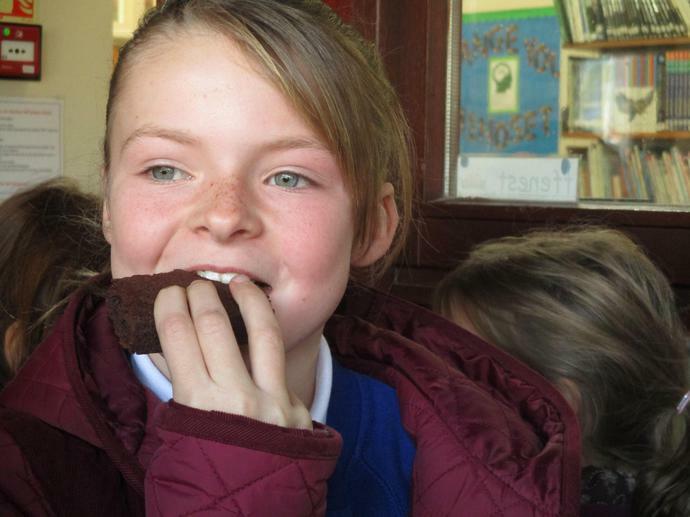 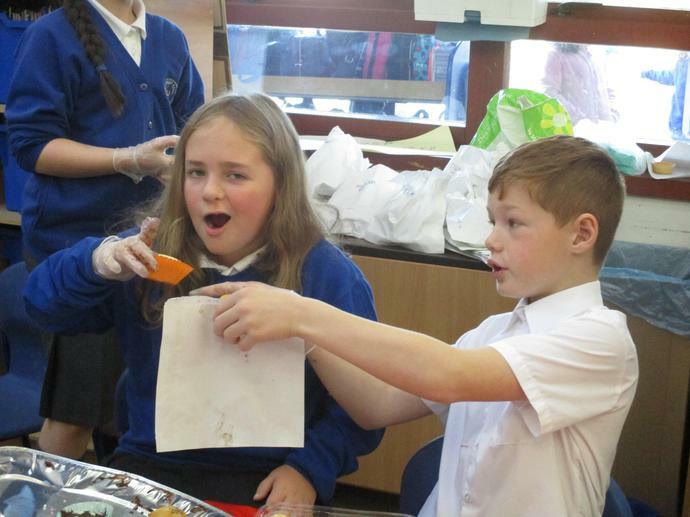 We have been involved with BBC 'Terrific Scientific', discovering what happens when we eat, how we taste and what happens to our food during digestion. 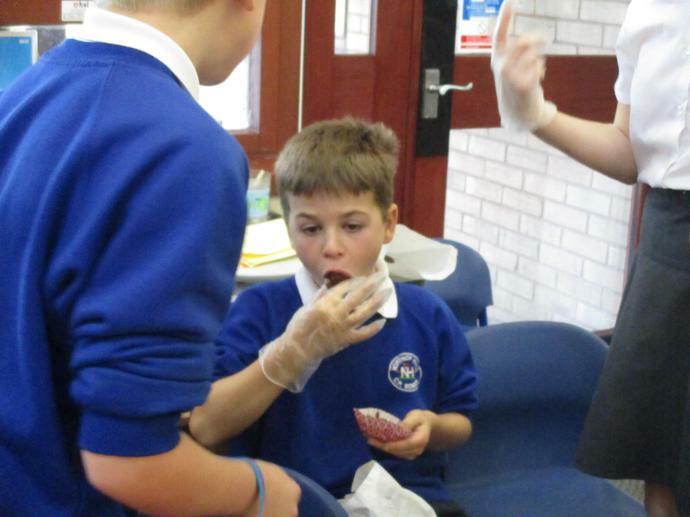 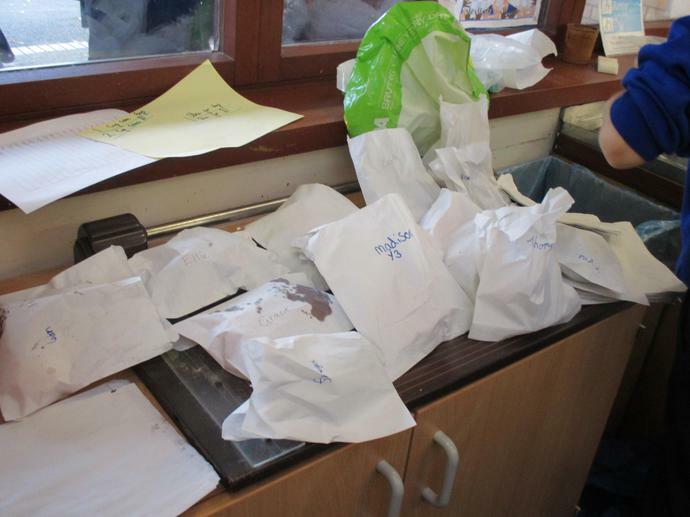 We were also lucky enough to have an afternoon carrying out scientific experiments in the labs at Hawarden High! 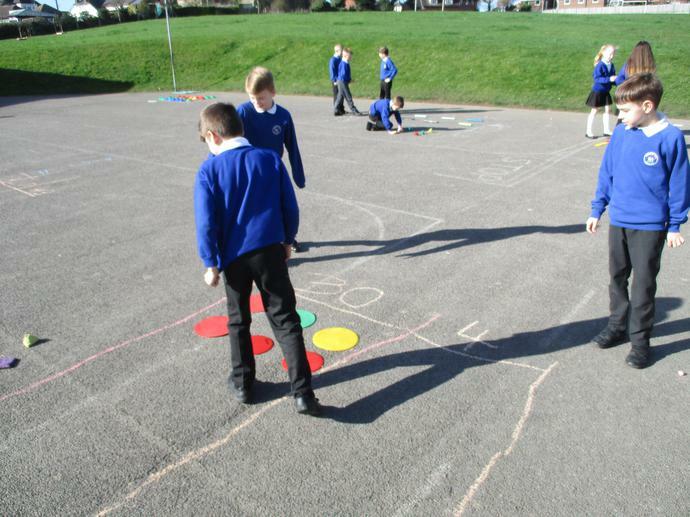 The children's reactions to such inspiring Science has been really positive as we continue to leave our footprint on BBC Terrific Scientific online map! 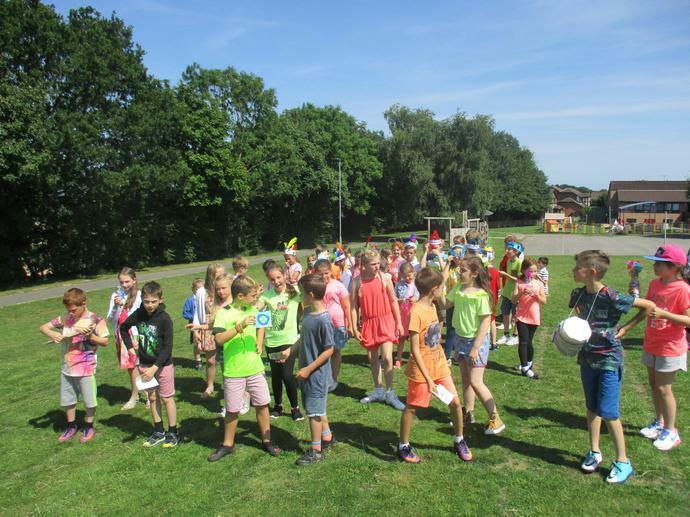 Merry Christmas and a Happy New Year Year 5! 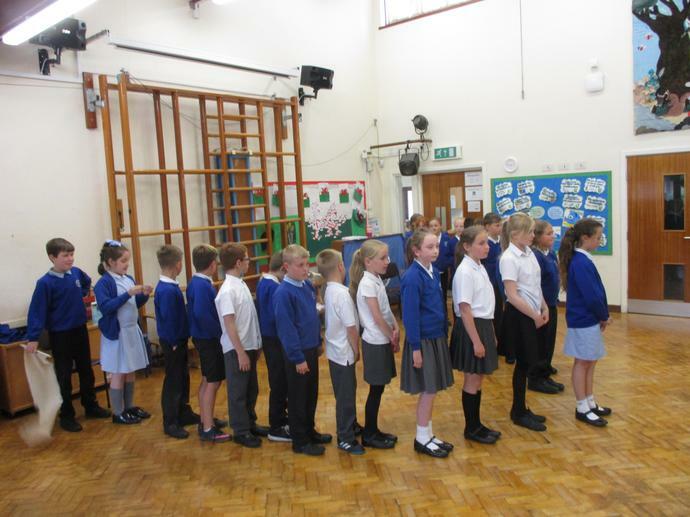 I would like to thank the children and parents for a fantastic, successful first term and for welcoming me to Northop Hall. 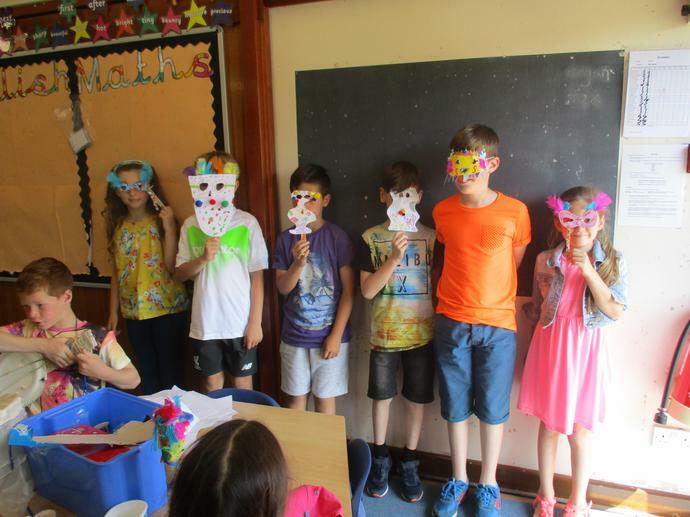 I hope that you all have a lovely Christmas and enjoy a well earned break, ready for another exciting term and ready to learn all about the Romans! 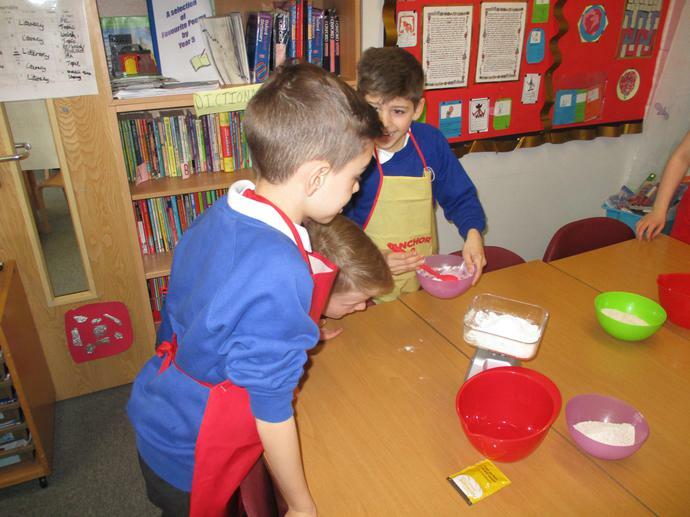 Busy creating Christmas pictures and stories. 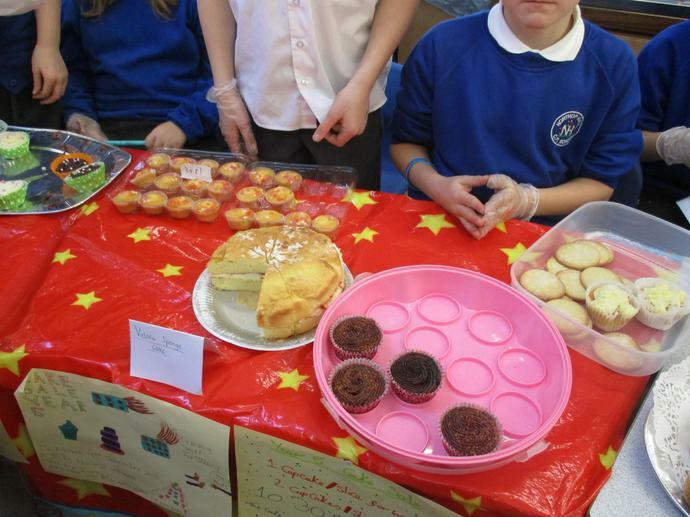 A Successful Year 5 Christmas Enterprise. 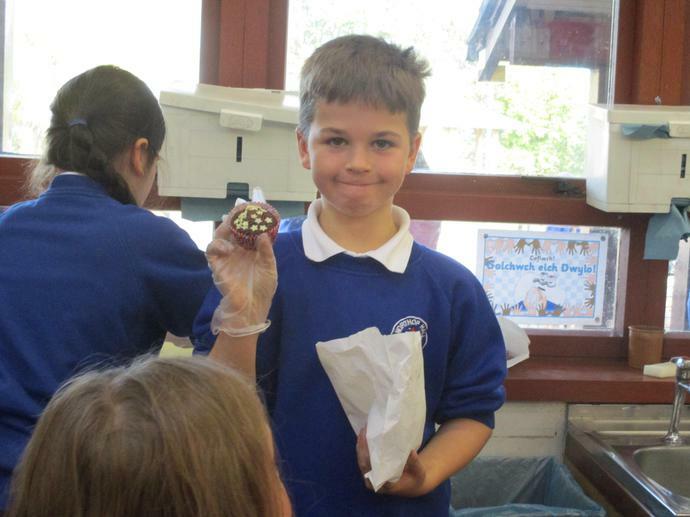 Year 5 Christmas wreath stall. 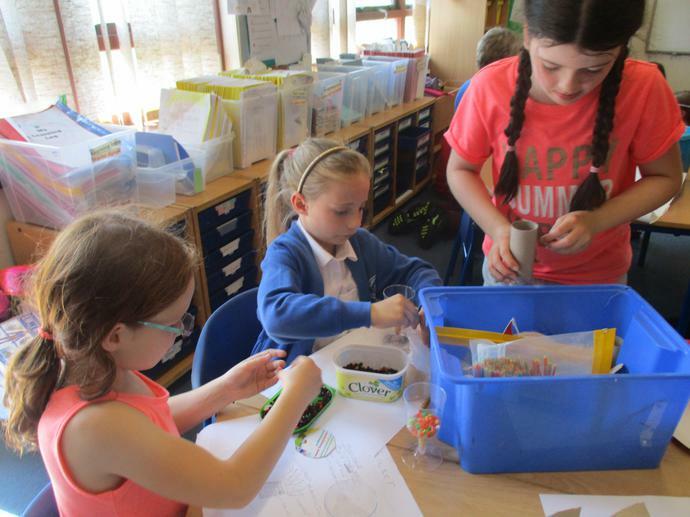 Year 5 children worked very hard making Christmas wreath table centre pieces, to raise funds for class resources at this year's Christmas fair. 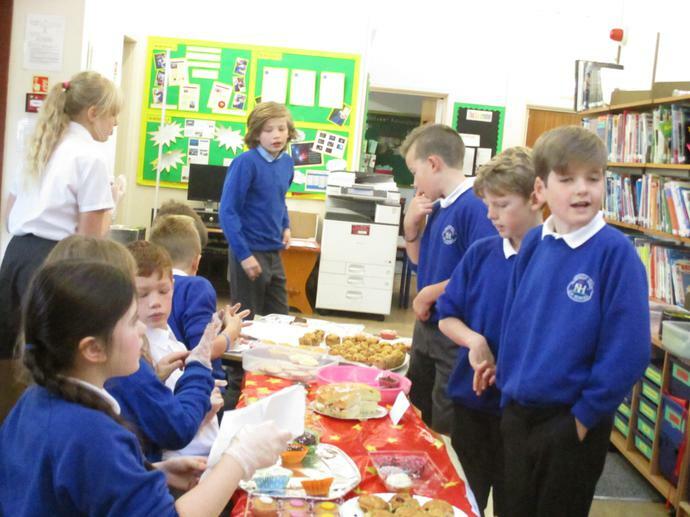 With extra help on the night from hard working Year 5 volunteers, we raised £51.70 from sales. 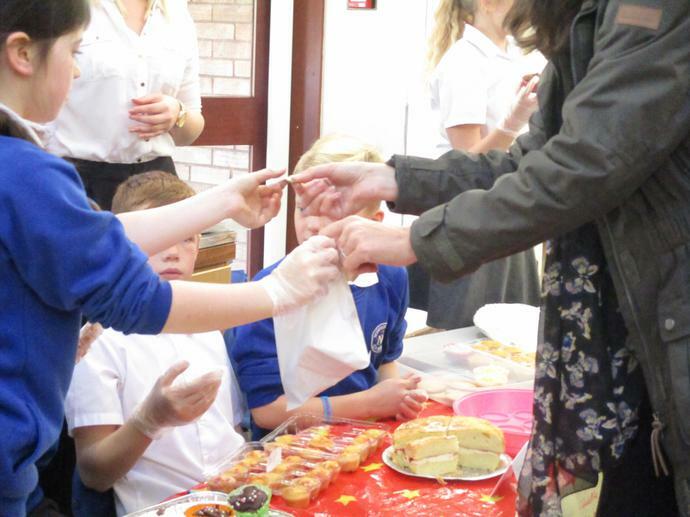 Thank you to all who gave us a visit! 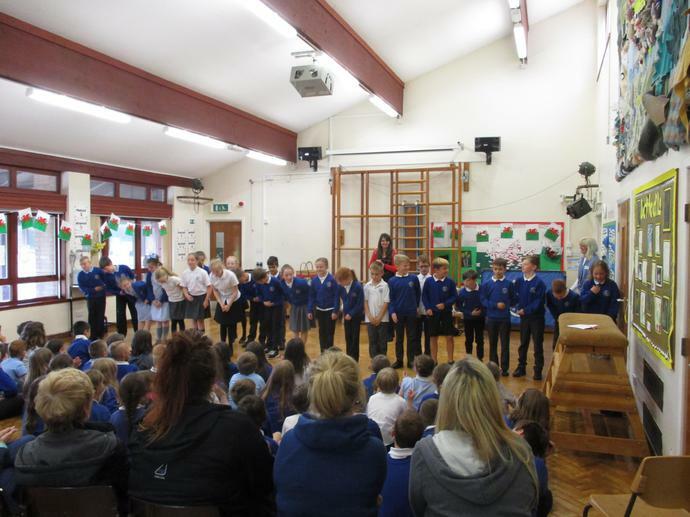 Preparations for this year's Christmas play are well under way. 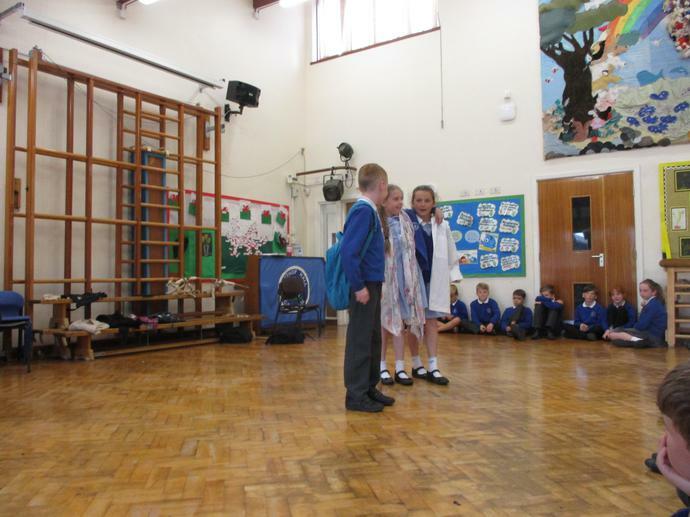 Children with speaking parts have been notified about their costumes and those who are singers are asked to wear a Christmas jumper for the performance. 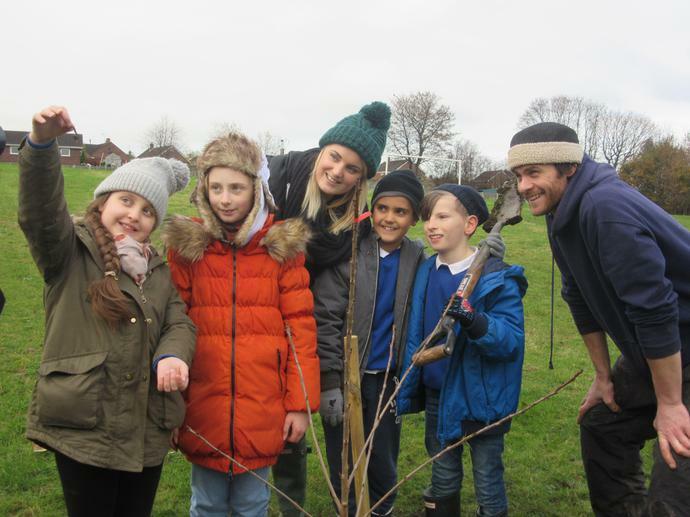 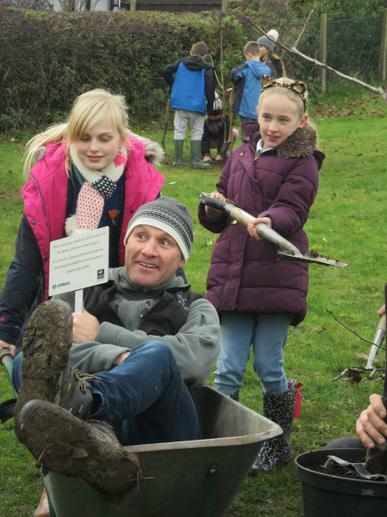 We had the most lovely day planting a mixture of fruit trees for our new School orchard. 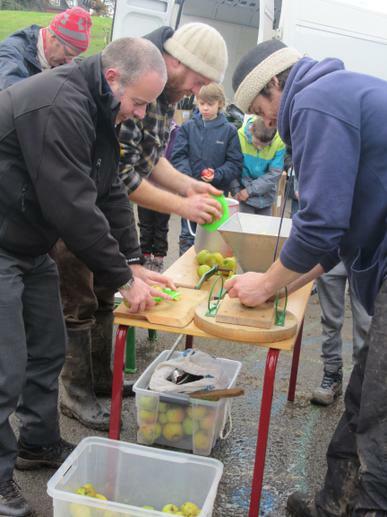 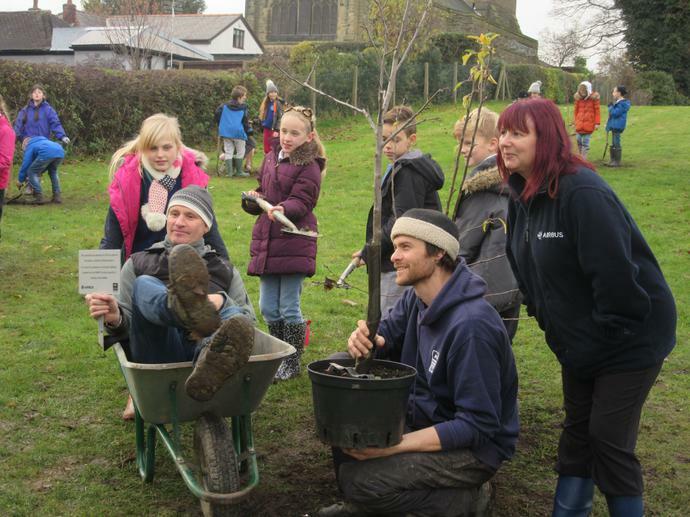 Everyone joined in learning names of fruits in Welsh, improving our digging techniques and understanding the correct way to plant young trees. 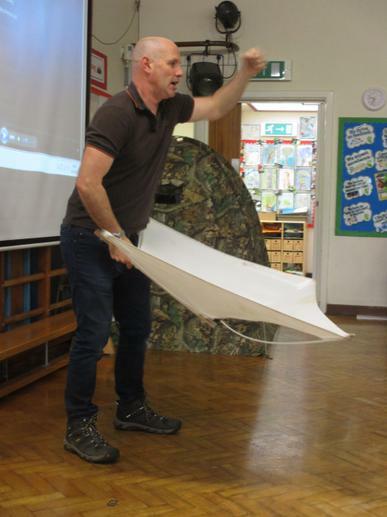 We were also lucky enough to work alongside Mike Dilger from BBC's 'The One Show', which we were all very excited about! 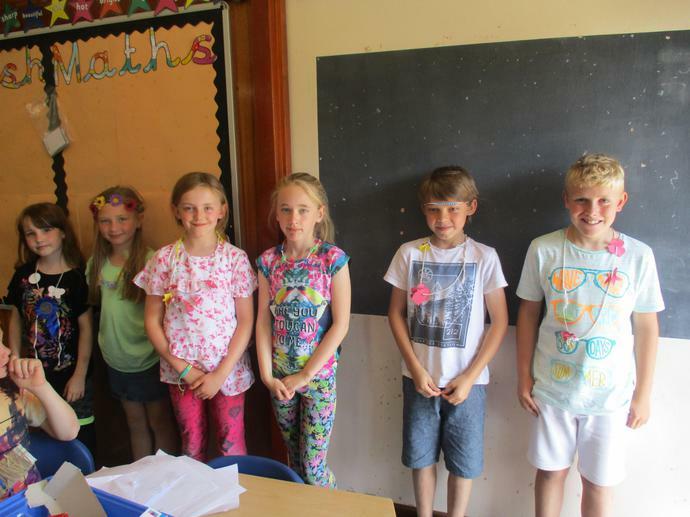 Just a reminder for all year 5 children, all yellow spelling books must be returned to school by each Monday in order to receive your new spellings for test every Friday. 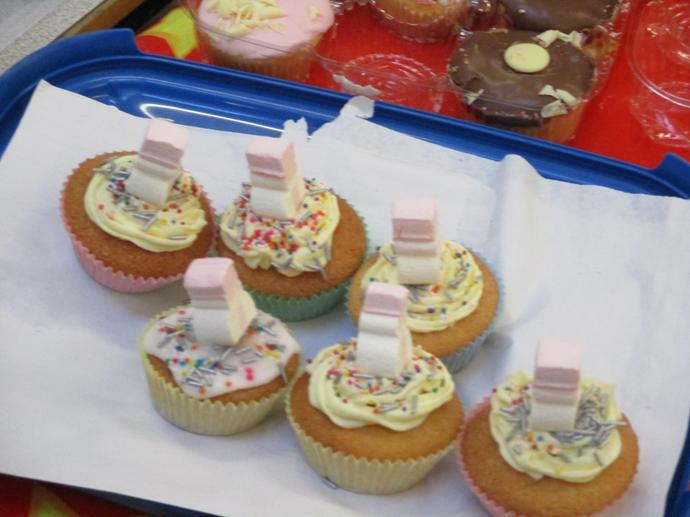 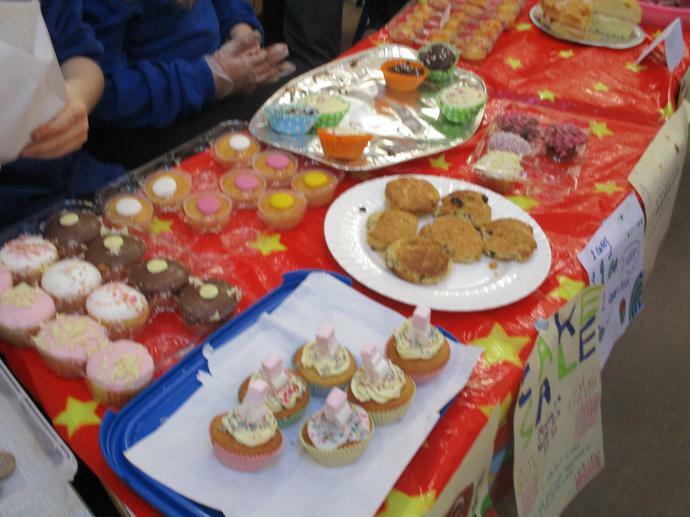 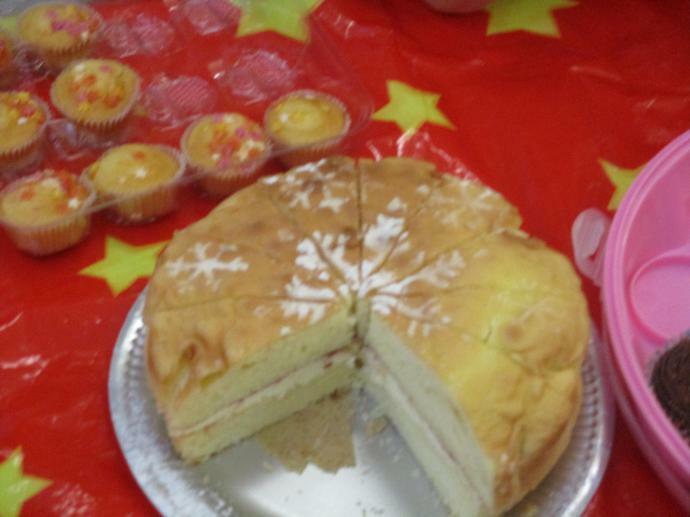 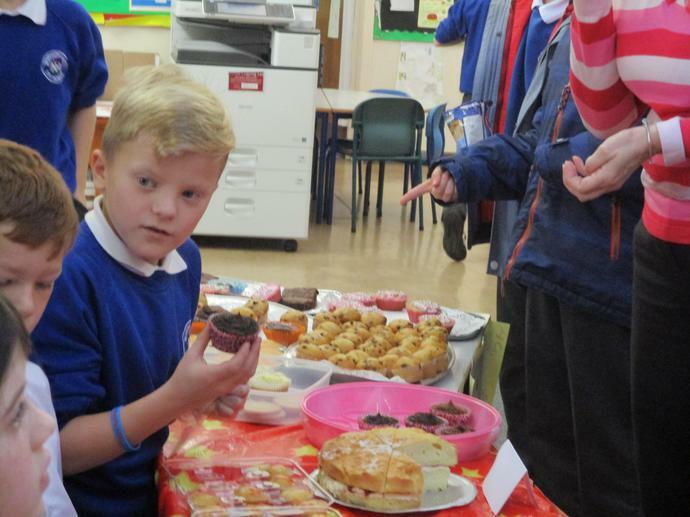 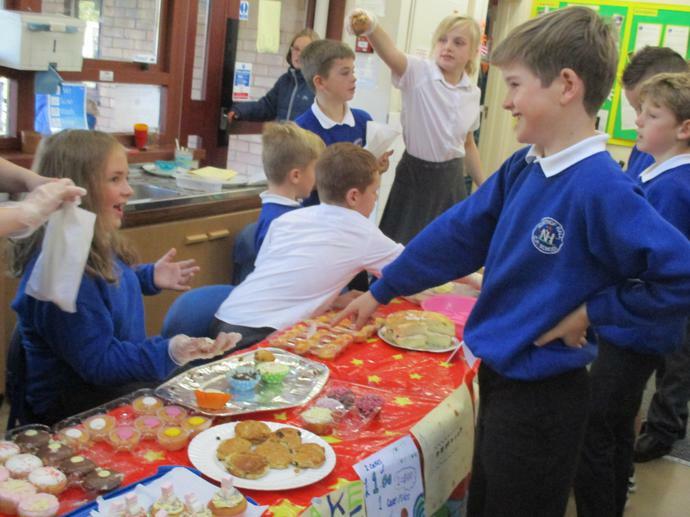 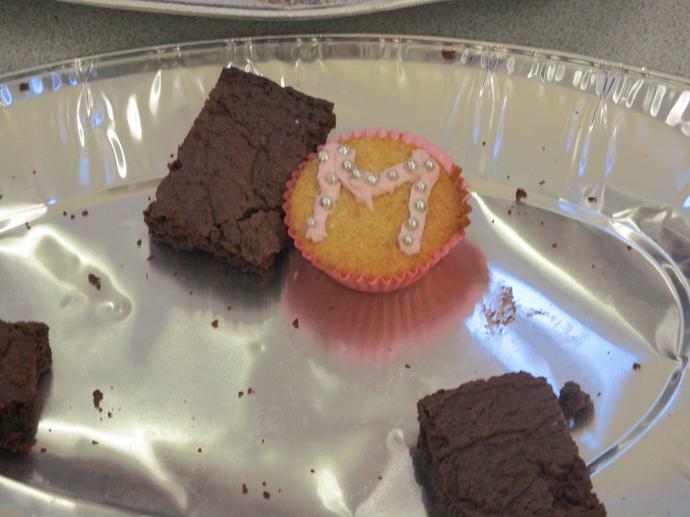 Thank you so much for all of your tasty donations for our fundraising cake sale in Year 5. 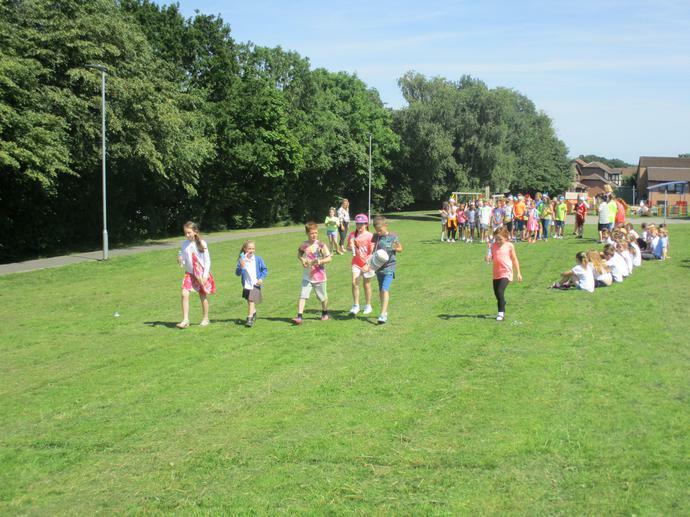 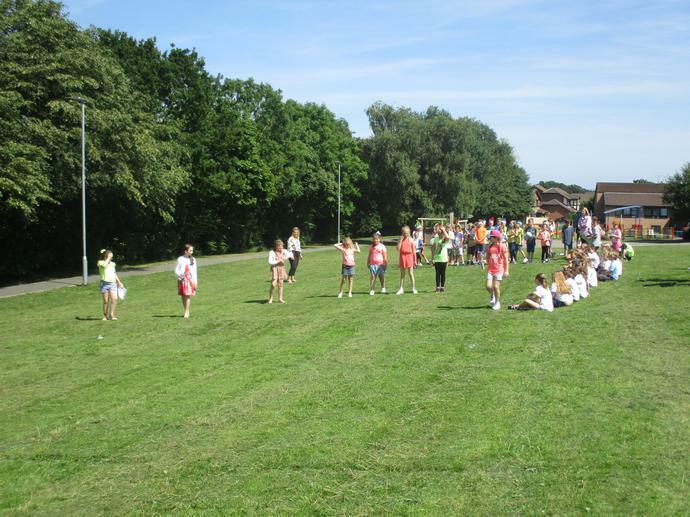 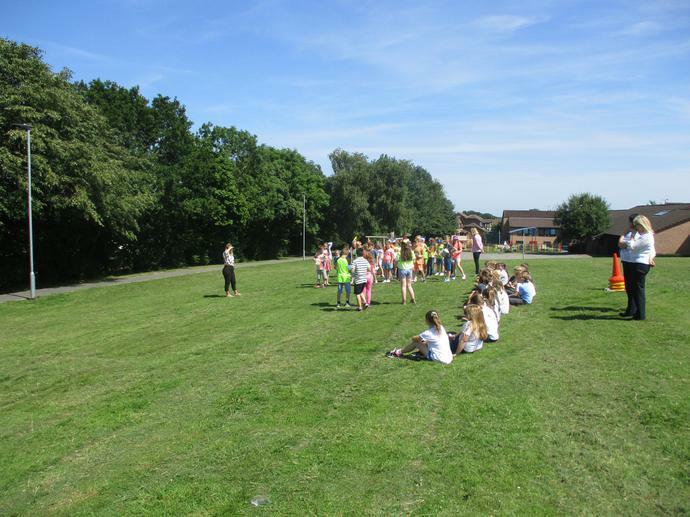 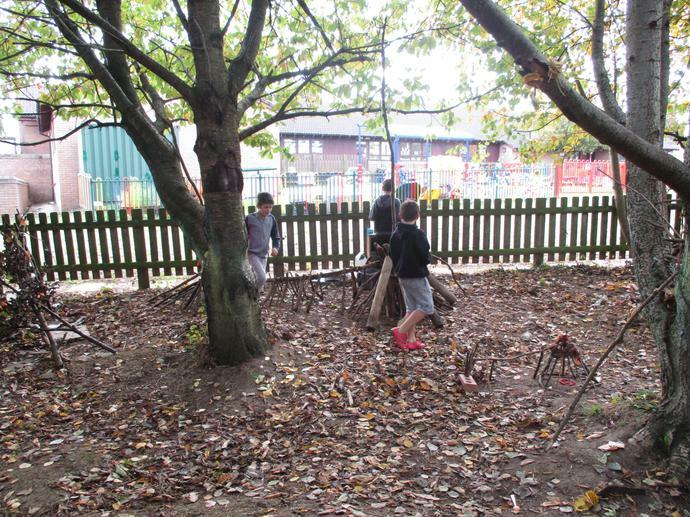 The children worked so hard to organise, set up and serve children and staff at points throughout the day. 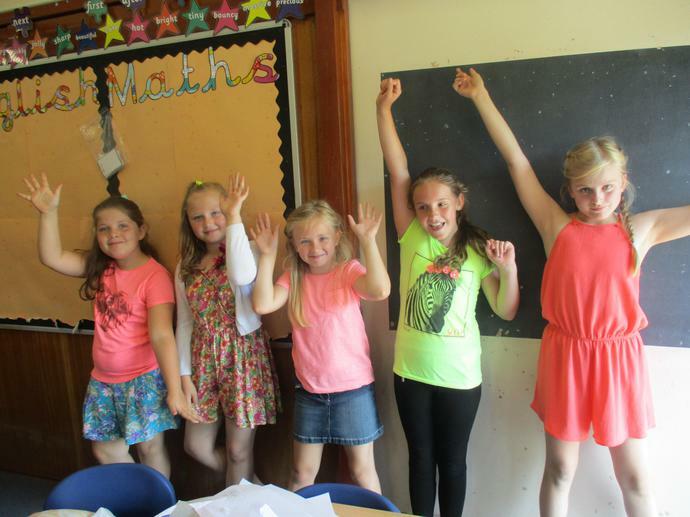 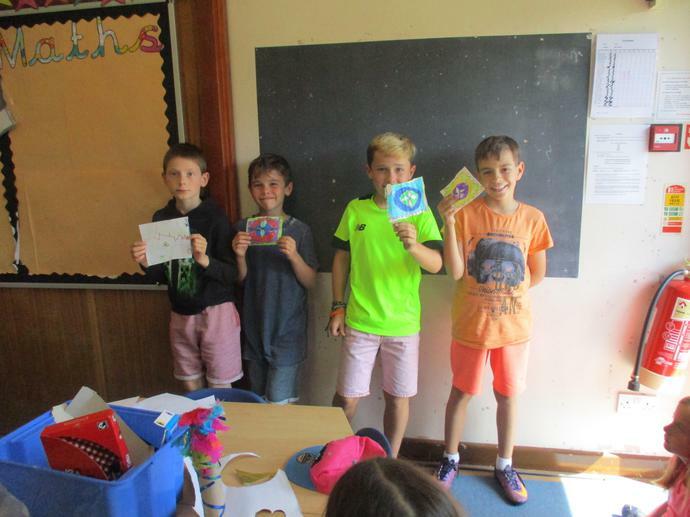 Thanks to your help we have smashed our target amount and raised a grand total of £99.22 towards our class trip later this month to Dangerpoint. 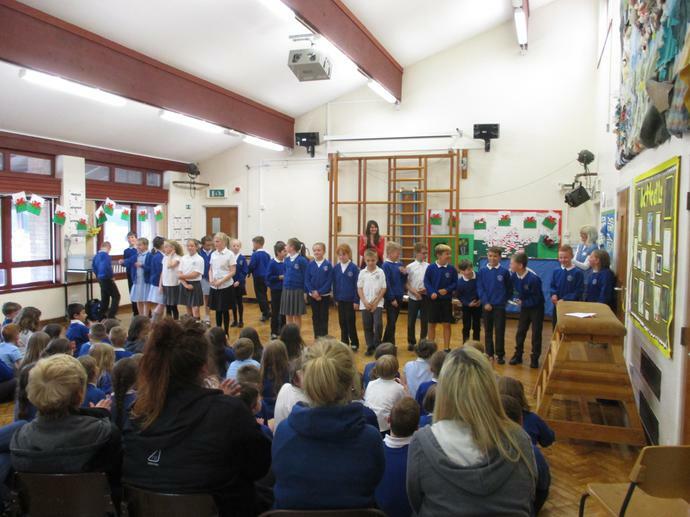 Very well done Year 5! 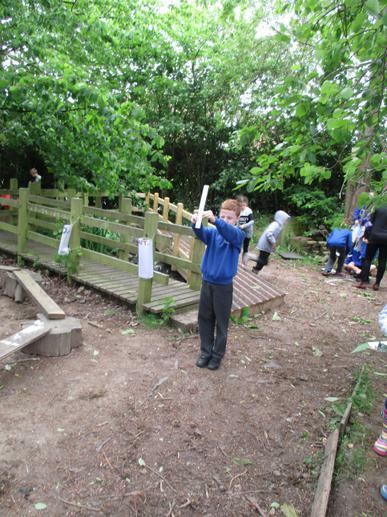 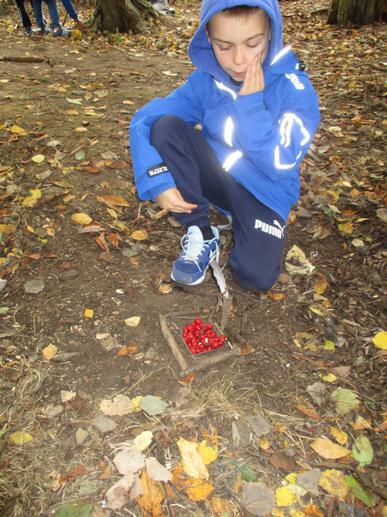 We have had such an exciting first half term in Year 5, our Outdoor Adventures topic has been very exciting so far. 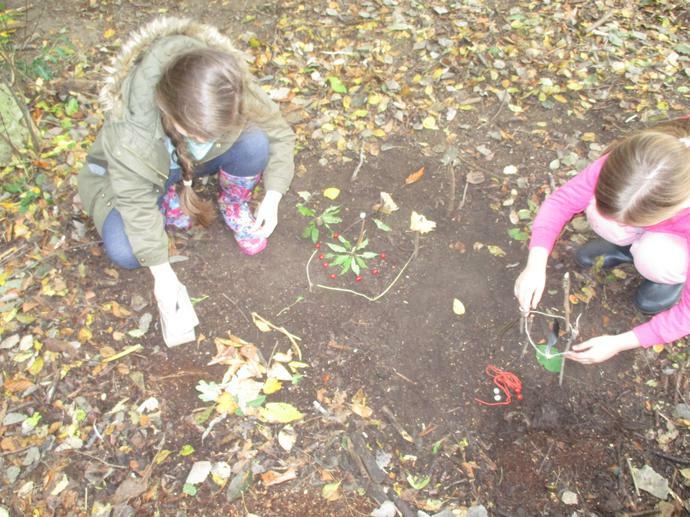 We have designed and created parachutes in Science, researched Outdoor Adventures in Scotland and produced persuasive leaflets, enjoyed creating natural art in Forest School with local artist Tim Pugh and applied our Maths to work out distances between Scottish destinations (linking to our class novel 'Skyhawk'). 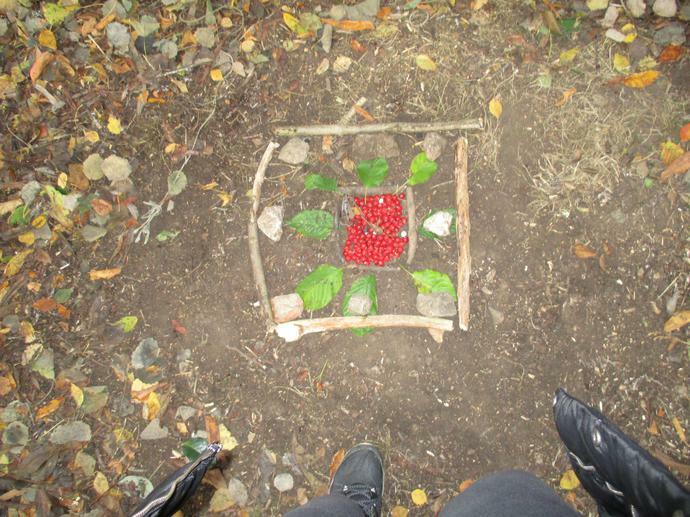 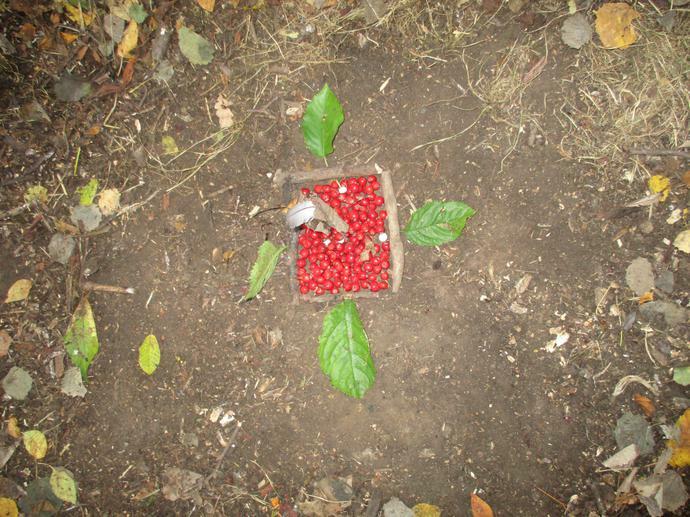 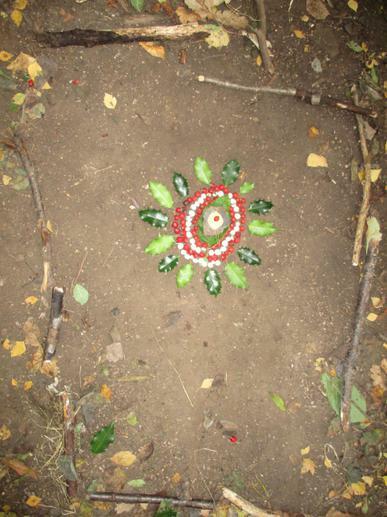 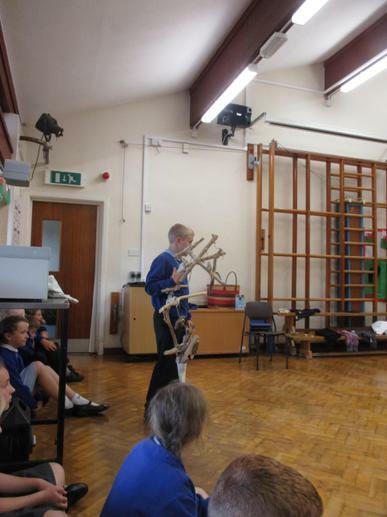 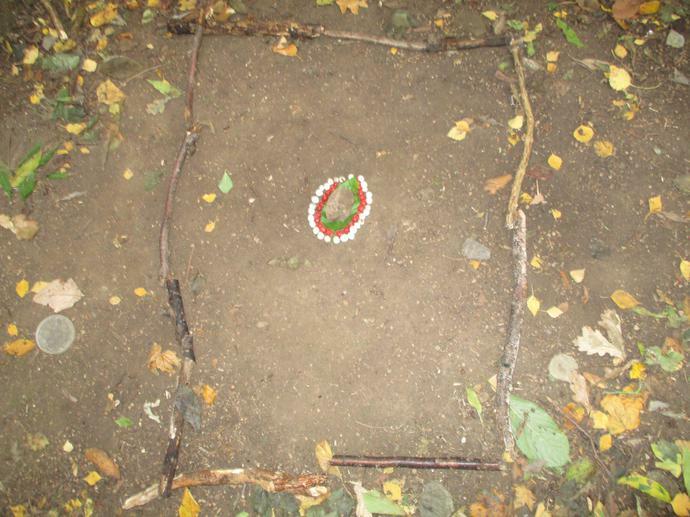 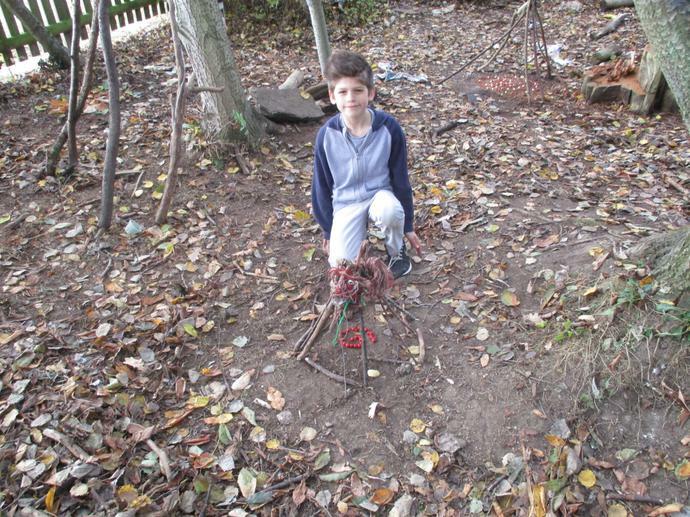 We hope that you enjoy the pictures of our natural art creations with Tim Pugh. 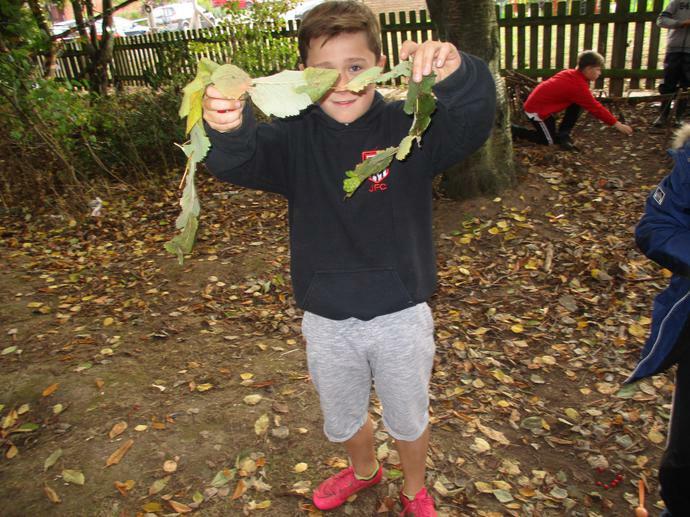 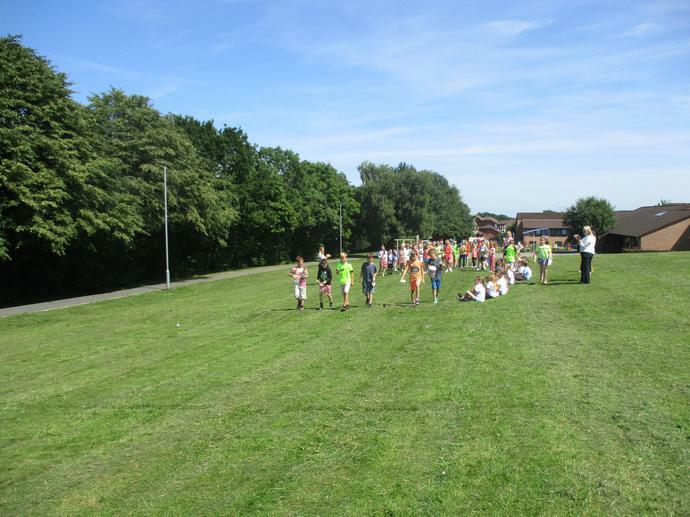 What an exciting first two weeks we have had in Year 5 with Roald Dahl Day, Nant BH visits and outdoor learning days! 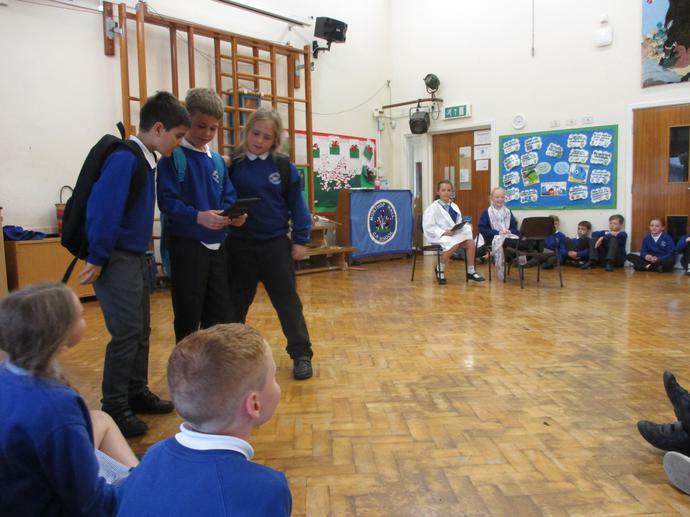 We celebrated Roald Dahl's 100th birthday with a 'Charlie and the Chocolate Factory' themed day in Year 5. 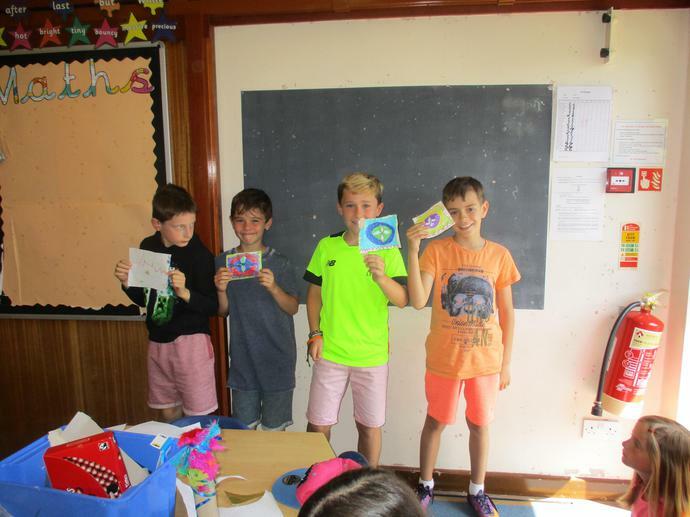 The children enjoyed designing their own Willy Wonka style chocolate bars and even made their own packaging to take their chocolate home in, much enjoyed by all! 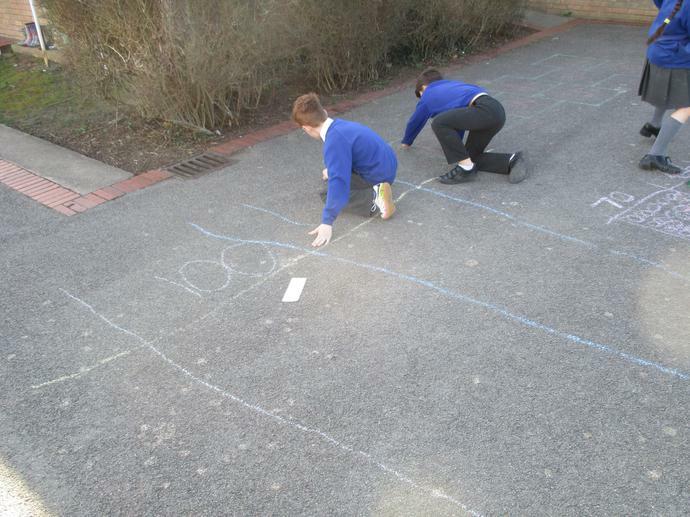 Alongside our designing work, we worked on some Willy Wonka maths, sorting numbers up to 1 million into place value and written words. 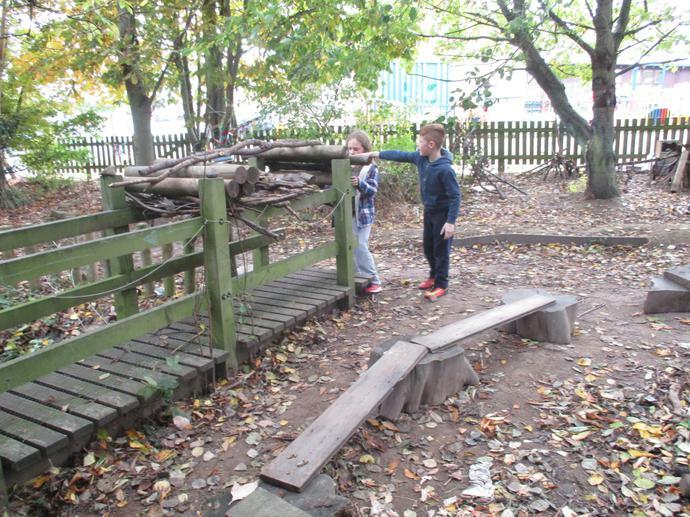 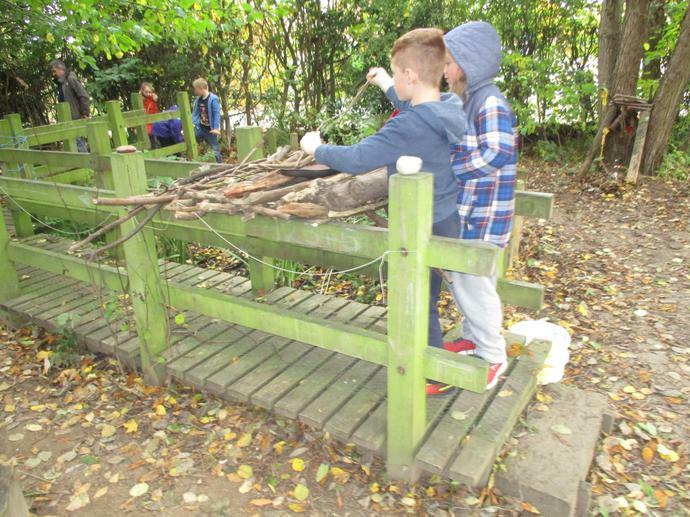 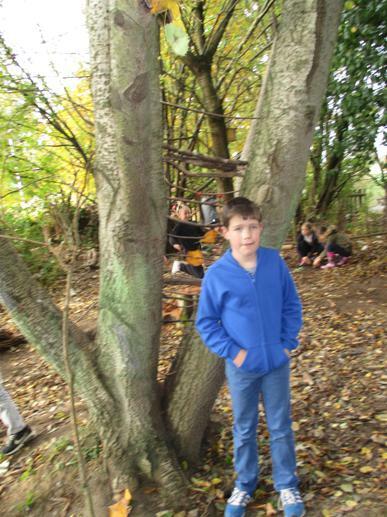 Our outdoor days have taken on a Forest School adventure, luckily the weather has been on our side throughout! 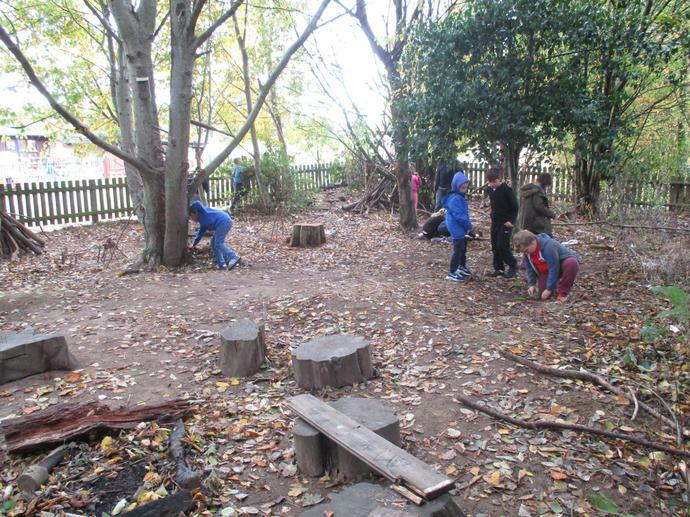 We have been busy making our own 'Wild things' from the famous story, 'Where the Wild Things Are', working out the age of trees and even making 3d shapes out of natural resources. 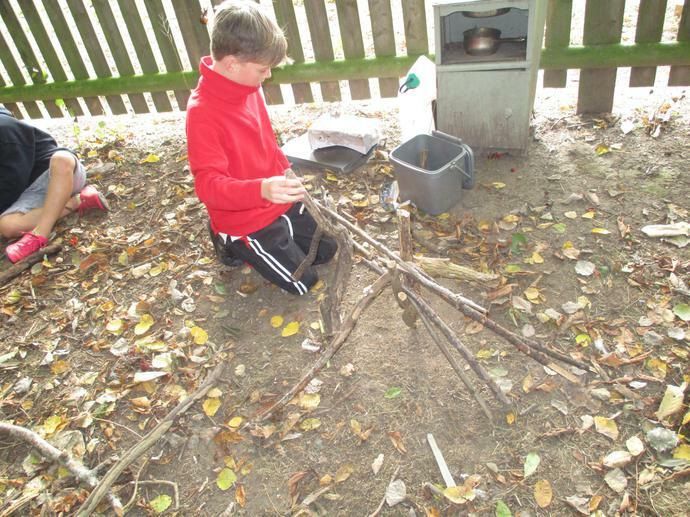 We look forward to seeing the photographs from Nant BH upon their return.